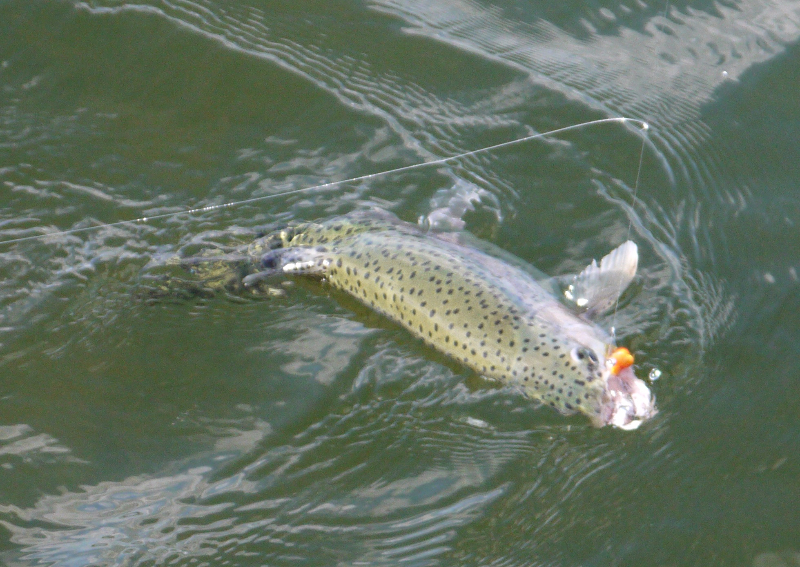 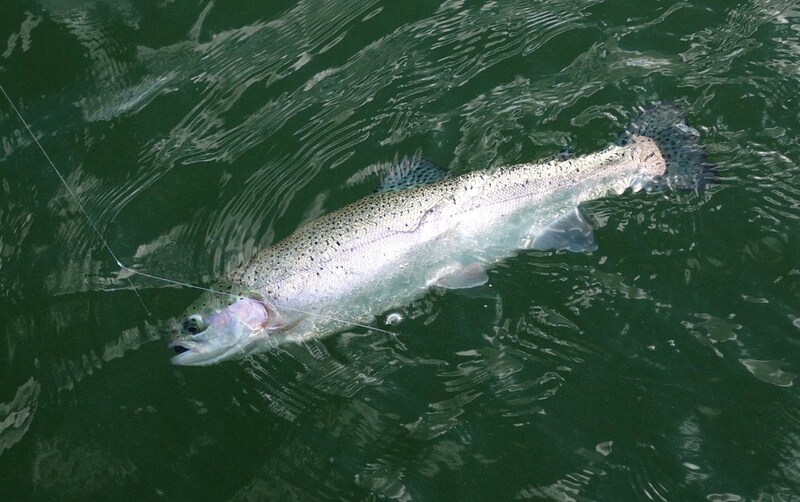 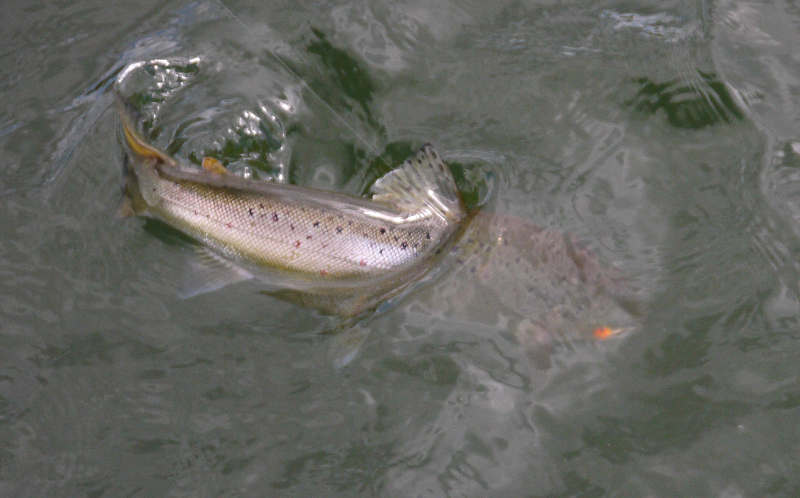 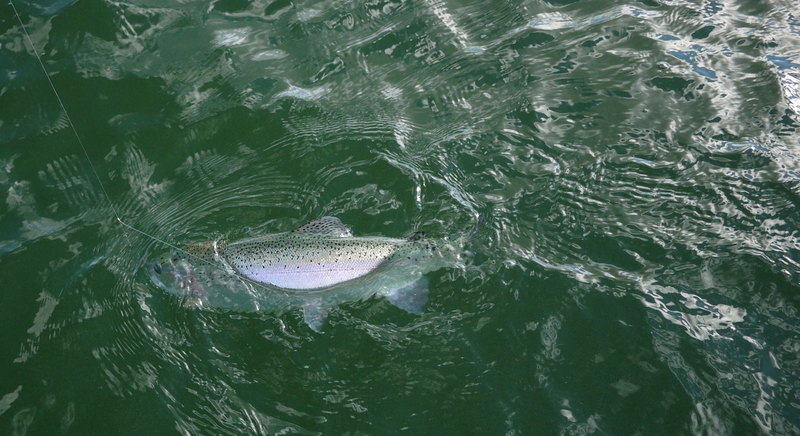 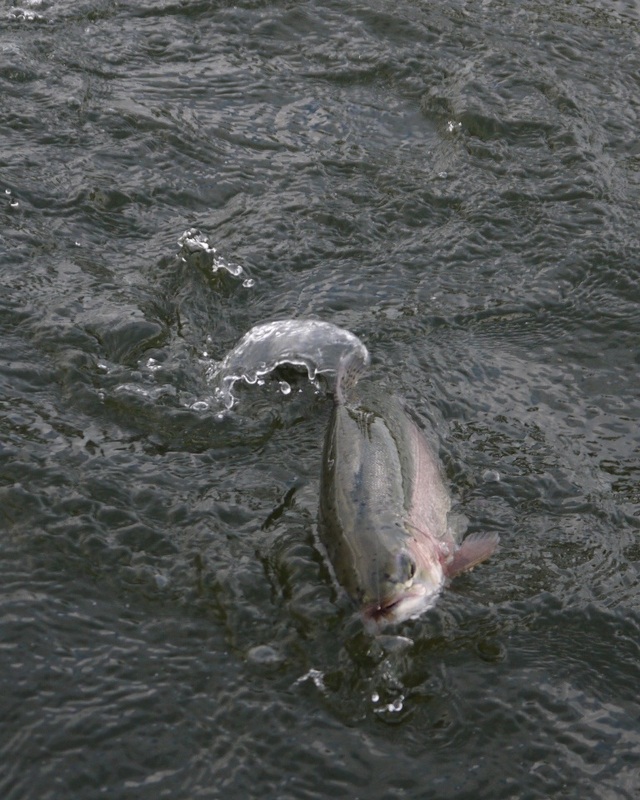 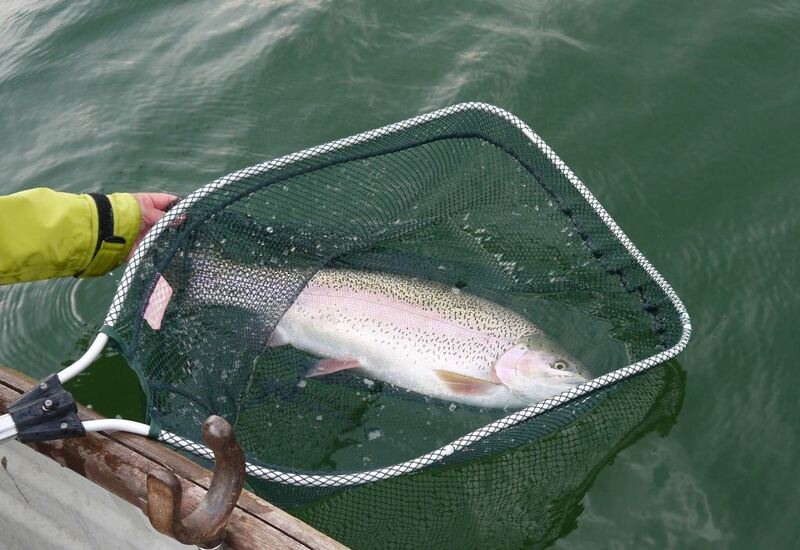 As usually, I paid more attention on stillwater fishing in spring. 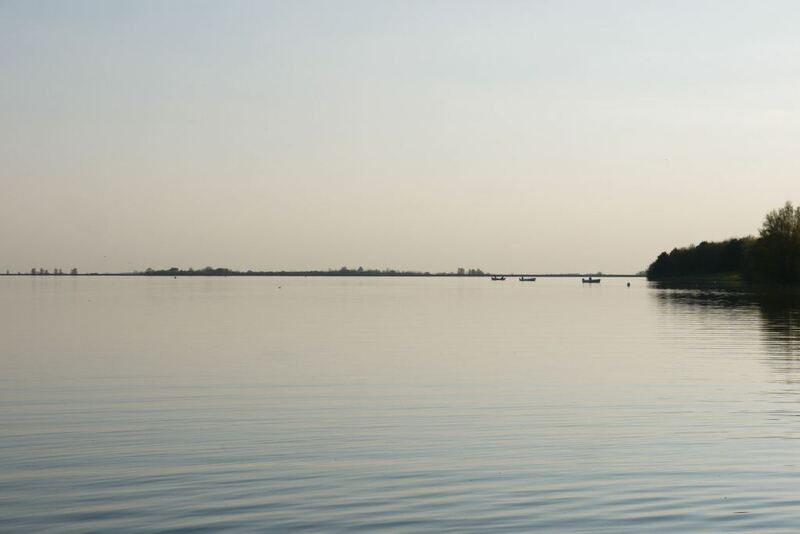 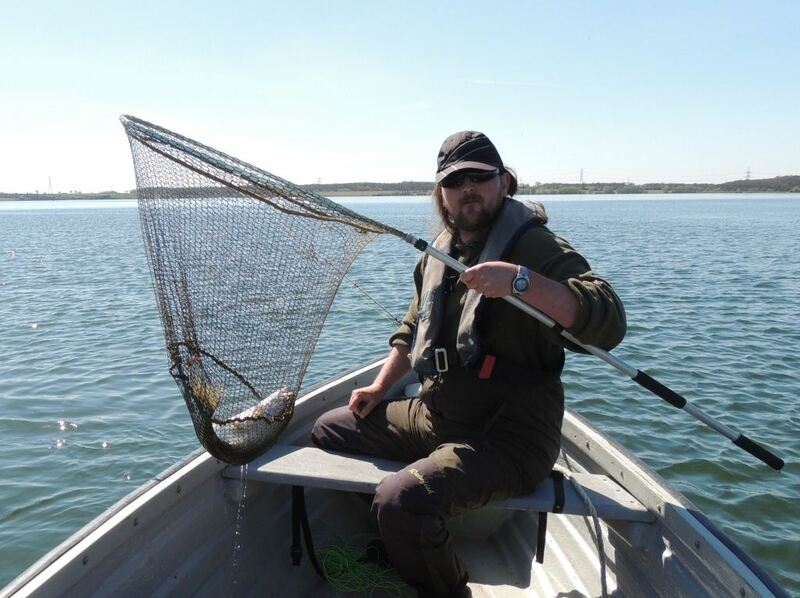 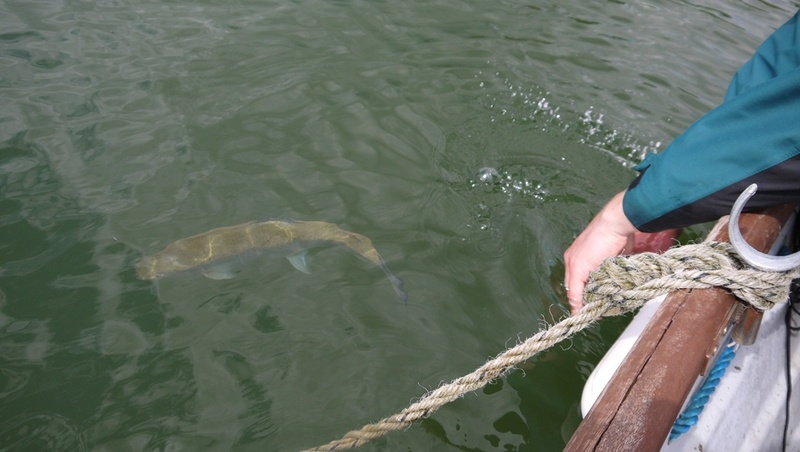 We changed management of the Květoňov lake, we removed all carp and pike in Autumn 2013 which positively affected water quality and survival rate of trouts, and lake is open for fishing whole year around since 2015. 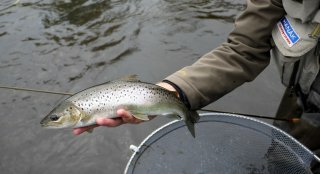 Ice melted in mid March, overwintered fish were hungry and in great condition, more over they were rising for hatching buzzers. 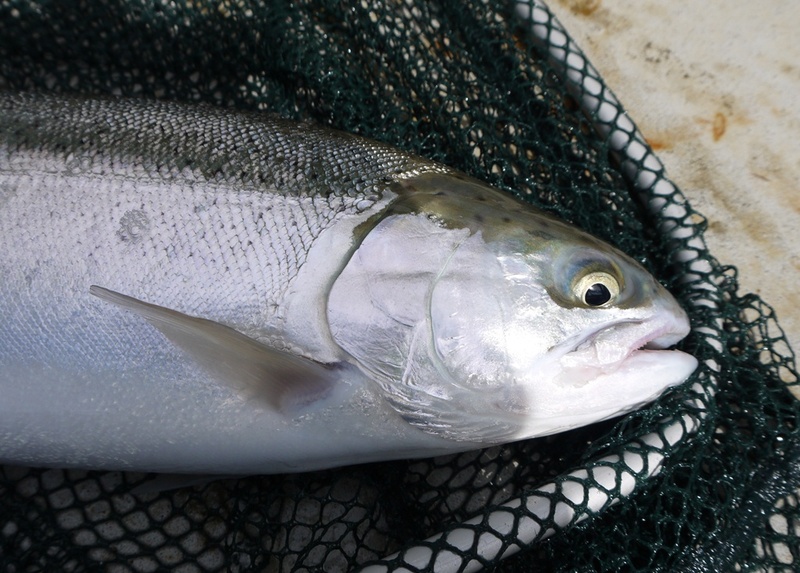 We started immediately regular stocking of fresh fish. 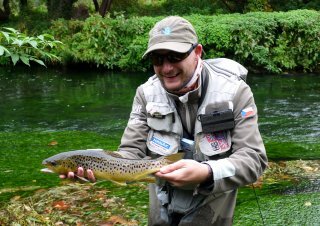 After quarantine in 2013 caused by infection, our hatchery is again able to produce good quality fish which is great message for our waters. 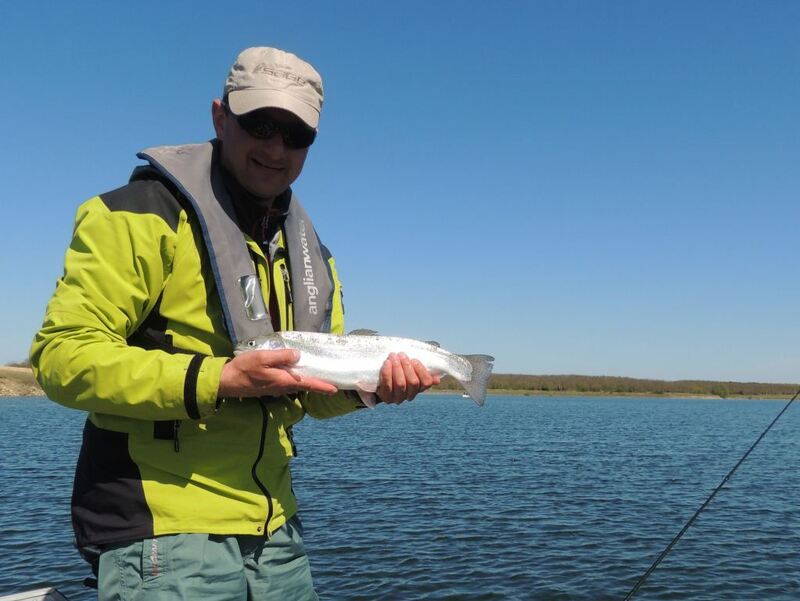 I was there few times and fishing was always good, we stocked also really big fish, on local fisherman almost get heard attack after I released trout of 4 kg. 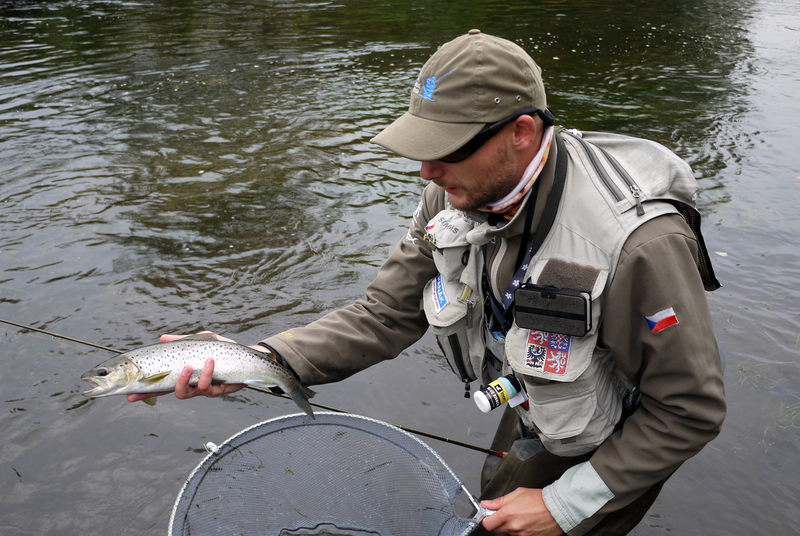 I attended three competitions, in Polička Cup I was third between 180 competitors after first day, but second day was not so good. 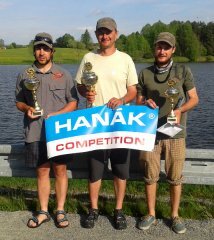 We organised Czech lake championship in Květoňov lake, I had been full of ambitions but I was again successful only first day. 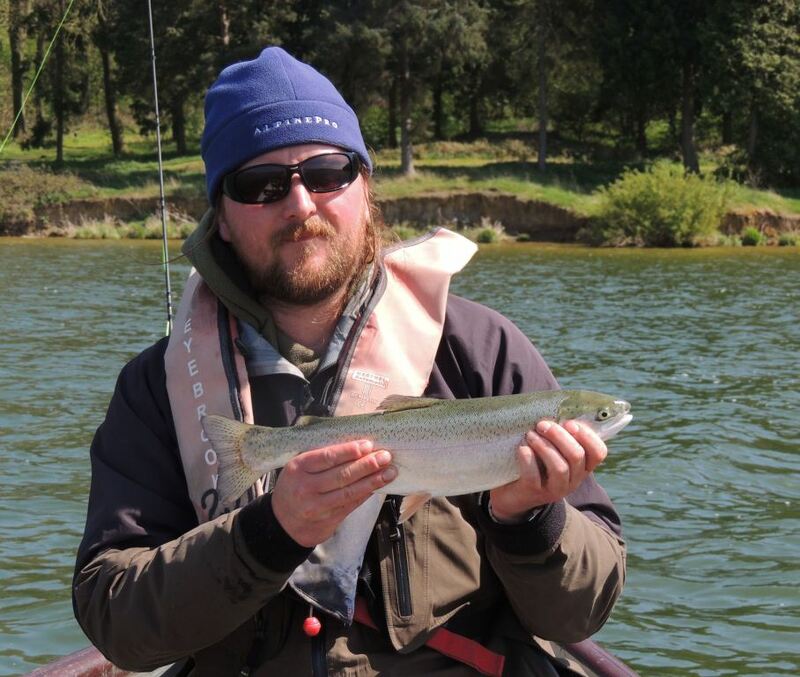 Finally I defended victory in May cup in Květoňov lake, and this three results lifted me to the TOP 20 in the running Czech fly-fishing ranking, not bad start of the season. 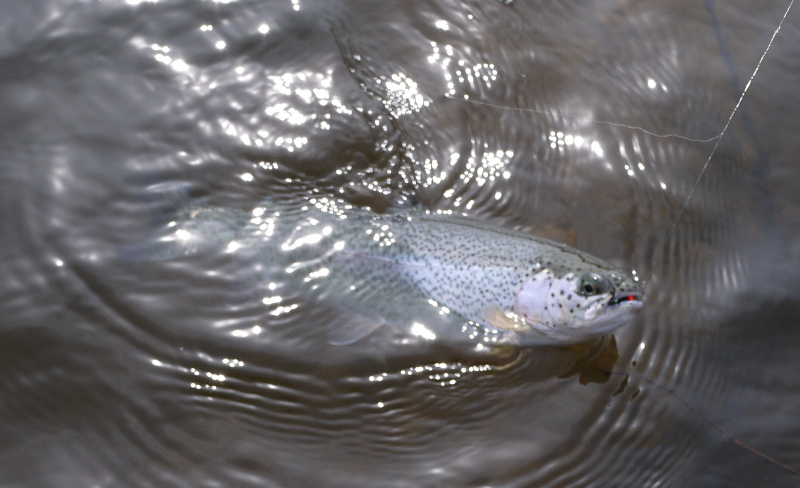 We will see in rivers. 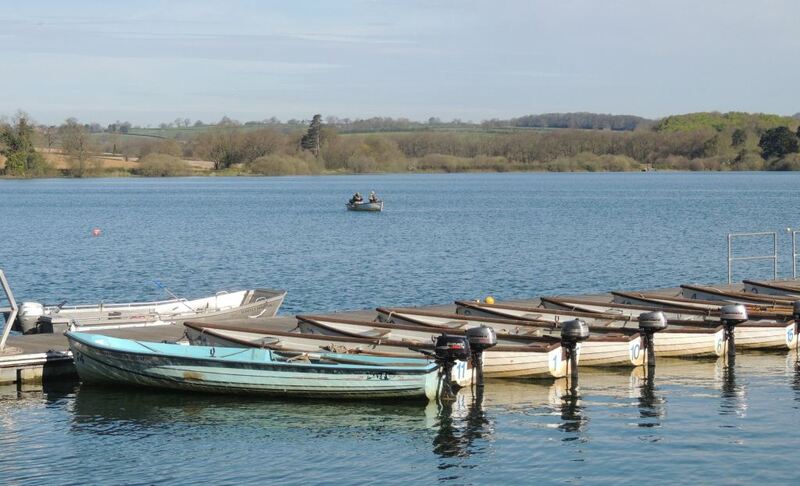 In the first week of May, I took group of my five friends to the traditional trip to England, we headed again to our favourite reservoirs in Midlands. 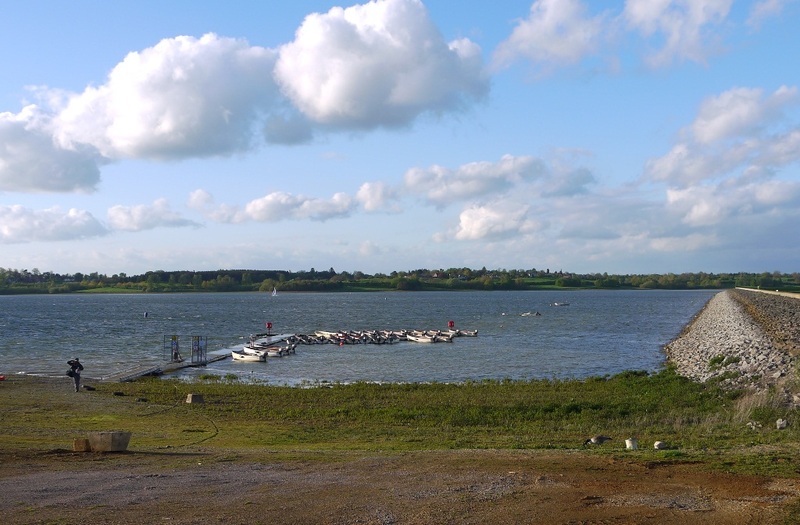 We flew from Prague to London Luton airport, which is ideal for our trips, as the WizzAir allows 32 kg baggage, airport is small and located about 1,5 hours driving from Eyebrook reservoir. 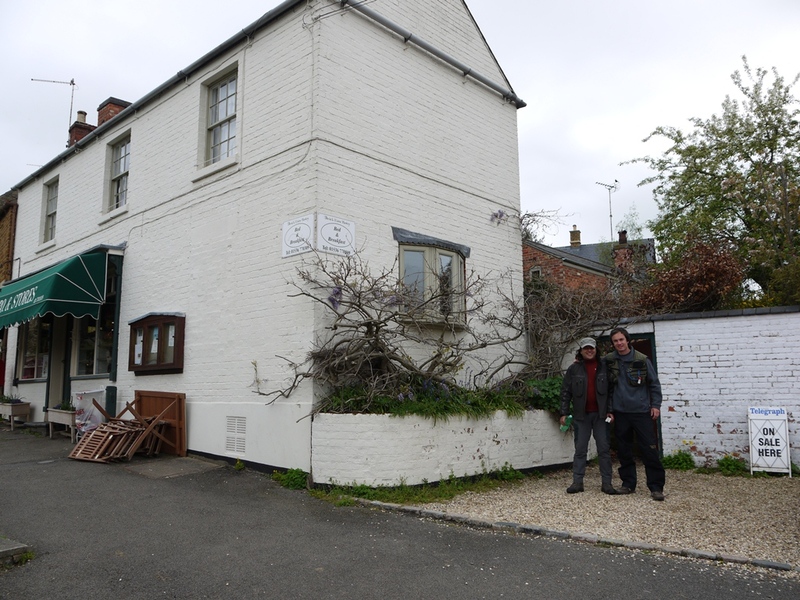 In the Car hire park we get Škoda Fabia and Škoda Octavia We stayed again in Great Easton B&B at Elaine and David Hankey. 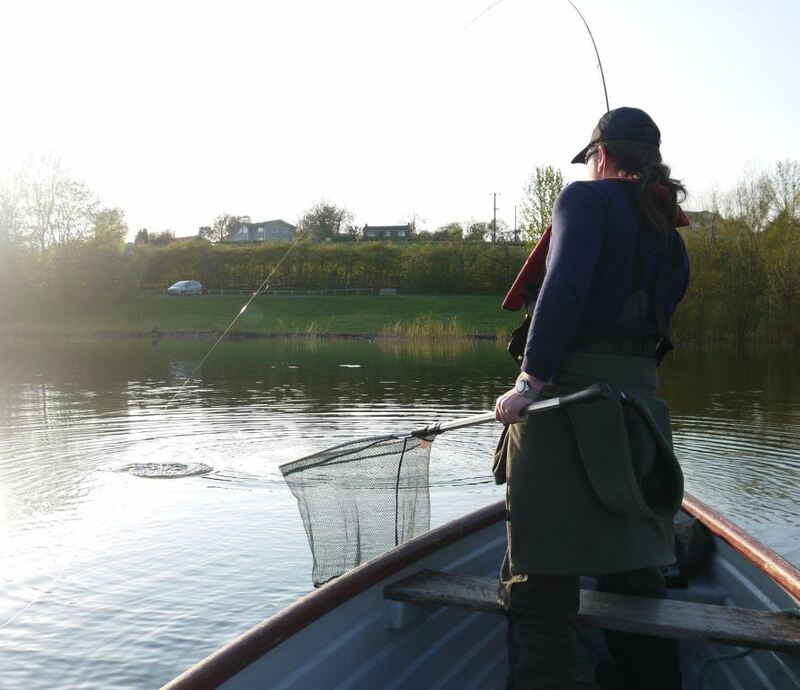 After our evening arrival, we met Julie and John Emerson at Eyebrook lodge to get actual info about fishing and after we welcomed with our lovely hosts, we went to pub to support local business. 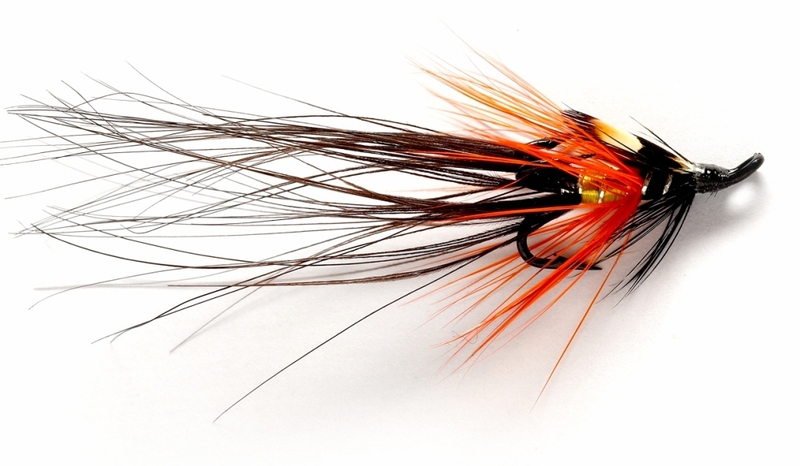 I love English Bitter. 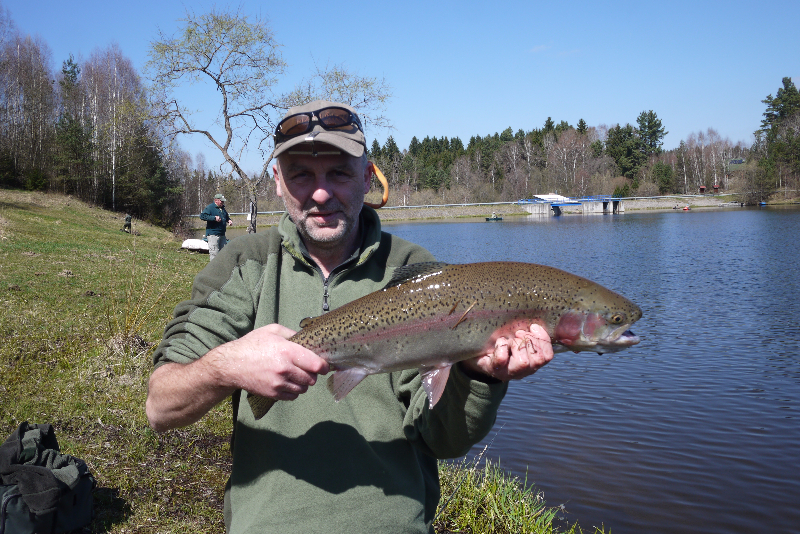 First day, after the full English breakfast, we fished Grapham, although I fish Lipno reservoir in Czech which has 4000 hectares, Grapham is for me water which deserve respect. 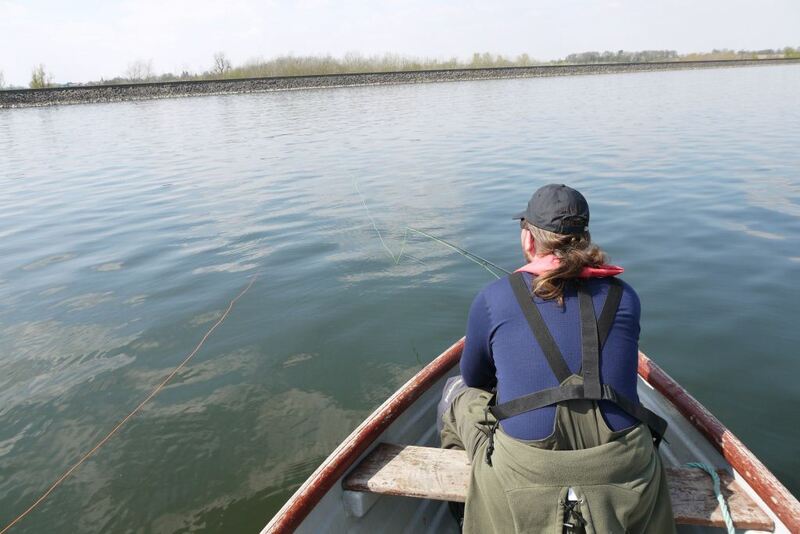 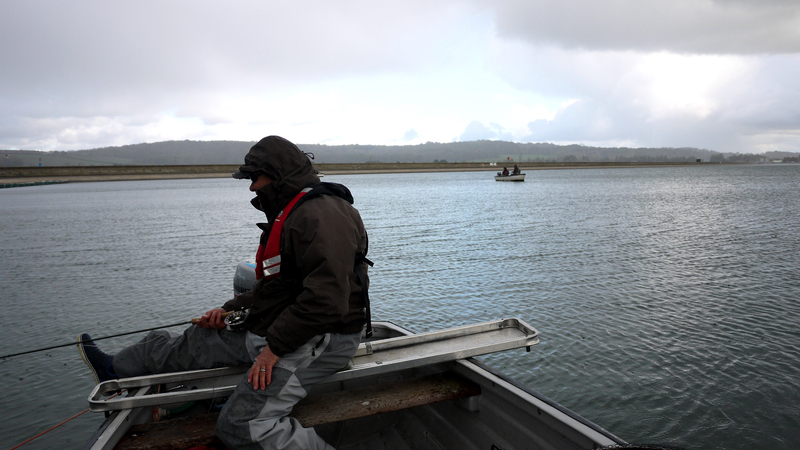 Air was full of small buzzers, water was clear, surface was full of nice ripples, what more could we ask for. 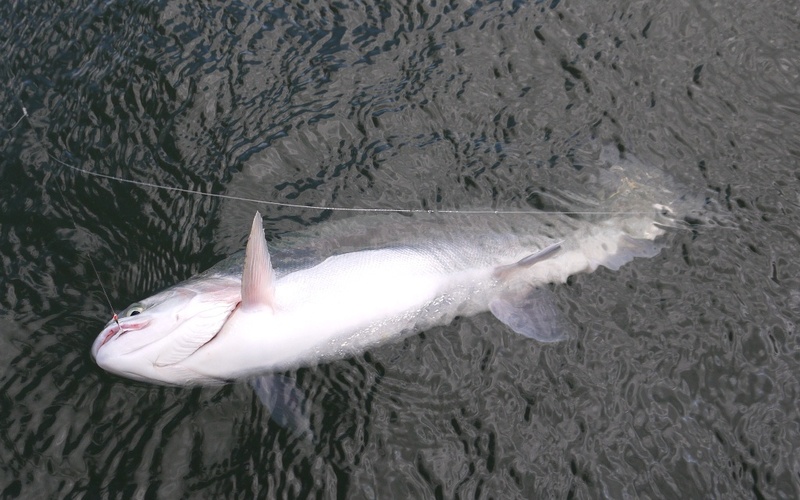 The key was to get black buzzers to the depth of 5-6 metres, we anchored in several places along the north shore and we get fish in all of them, we caught over 40 fish altogether and it was great start of the trip. 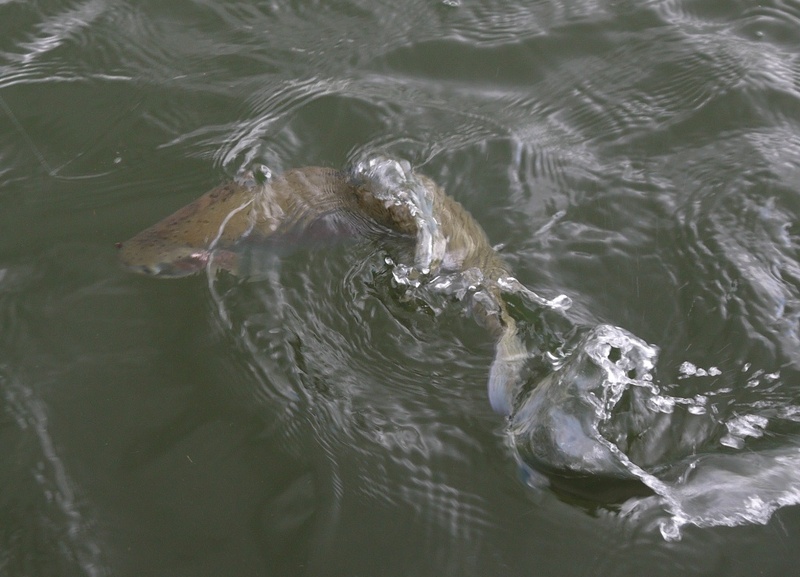 I also get fish on new blob which I got from John. 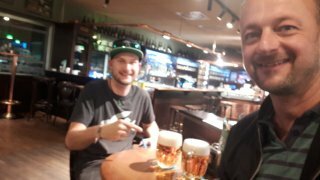 So we had a lot of experiences to talk about in the pub. 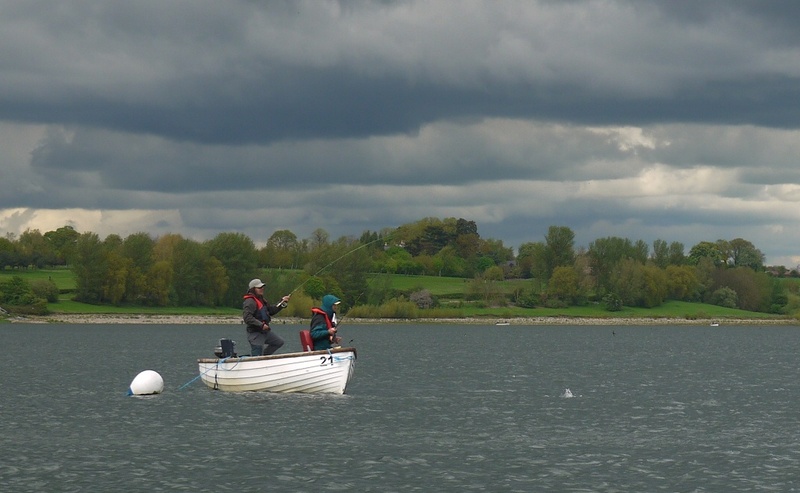 Second day we headed to Draycote. 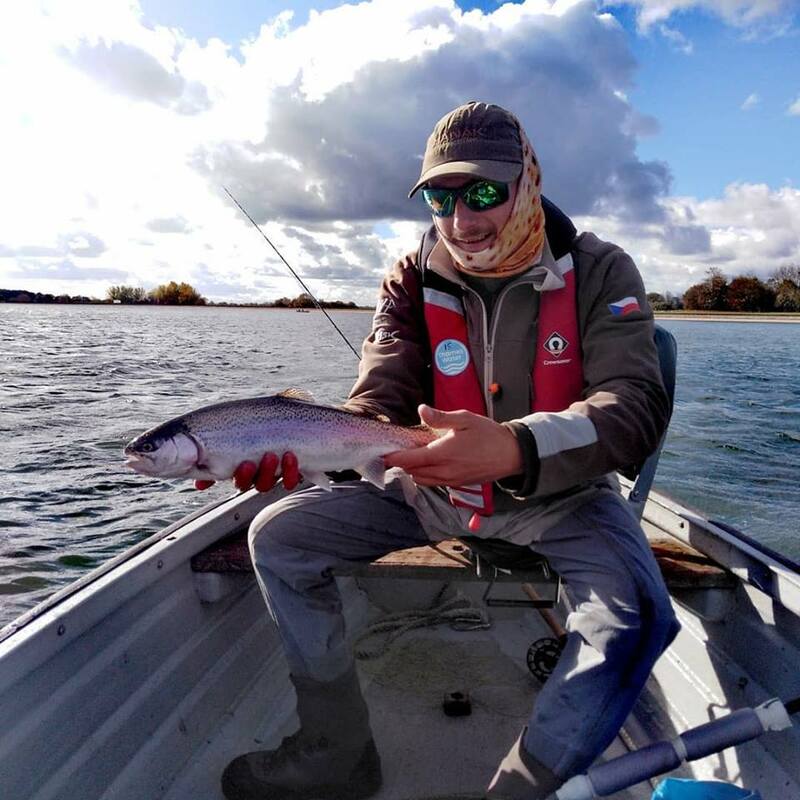 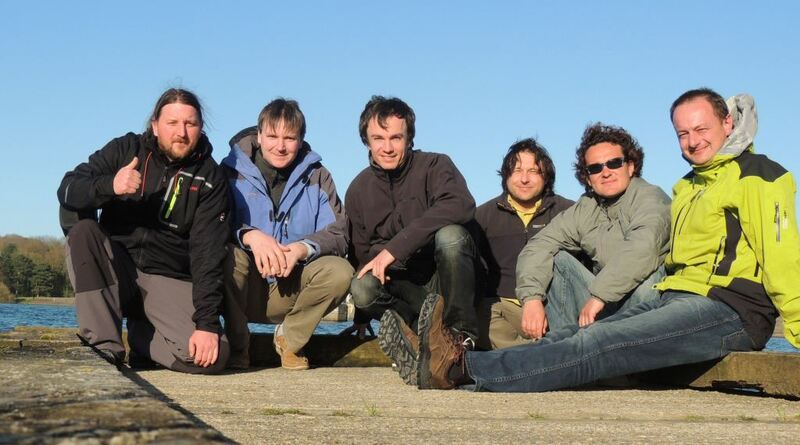 The day started with humorous skit when Lukáš equipped by new navigation overtook leadership of our group and in the very first crossroads turned to the left instead of to the right and drove to the right side of street instead of the left side. 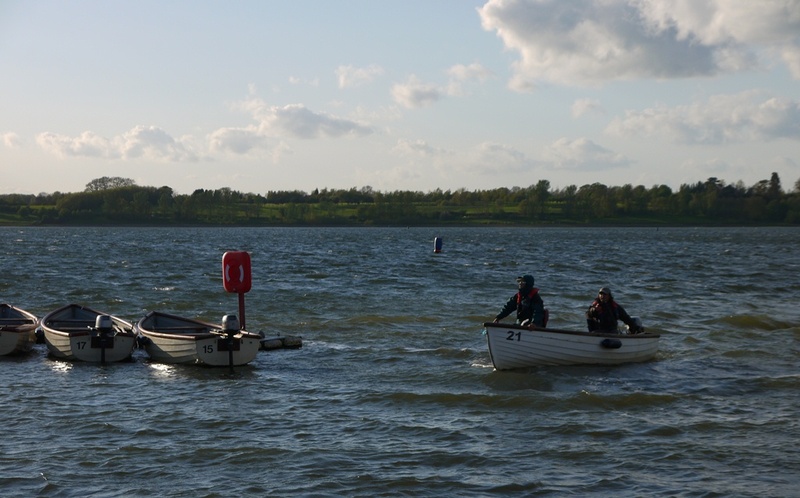 They stopped at first lights in front of cars in the opposite and after “short non verbal communication” directed to the right left side of the street Water in Draycote was relatively green and it was difficult to find fish, the choice of the place was absolutely essential, Peter and Paul were sitting in one boat and they were fishing same line, same leader and same flies and after 2 hours was score 15:6 for Peter who was sitting in the site close to the bank. 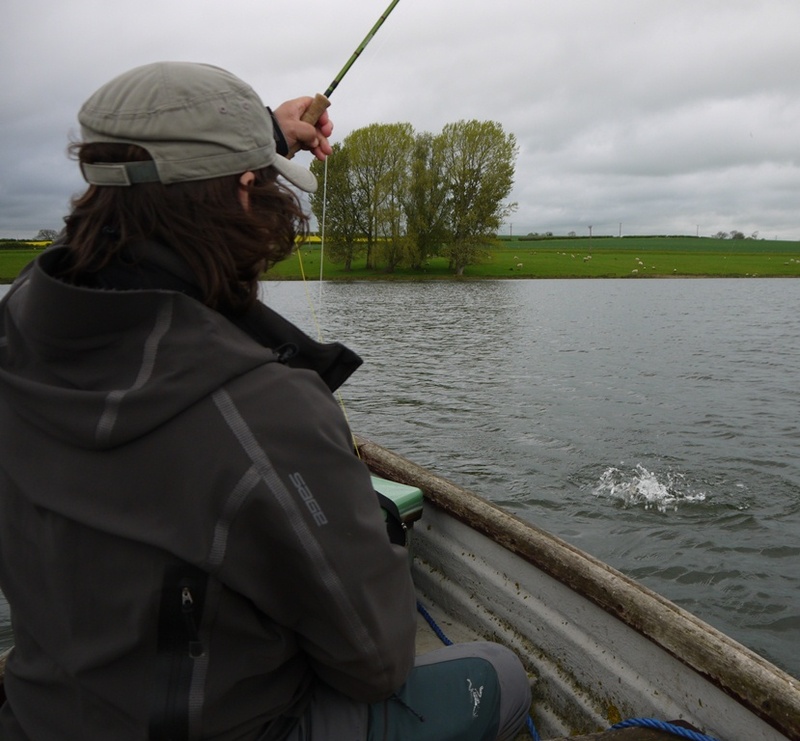 It was possible to catch fish everywhere, but frequency of takes was significantly higher in the right distance from bank, we got fish also just under the banks. 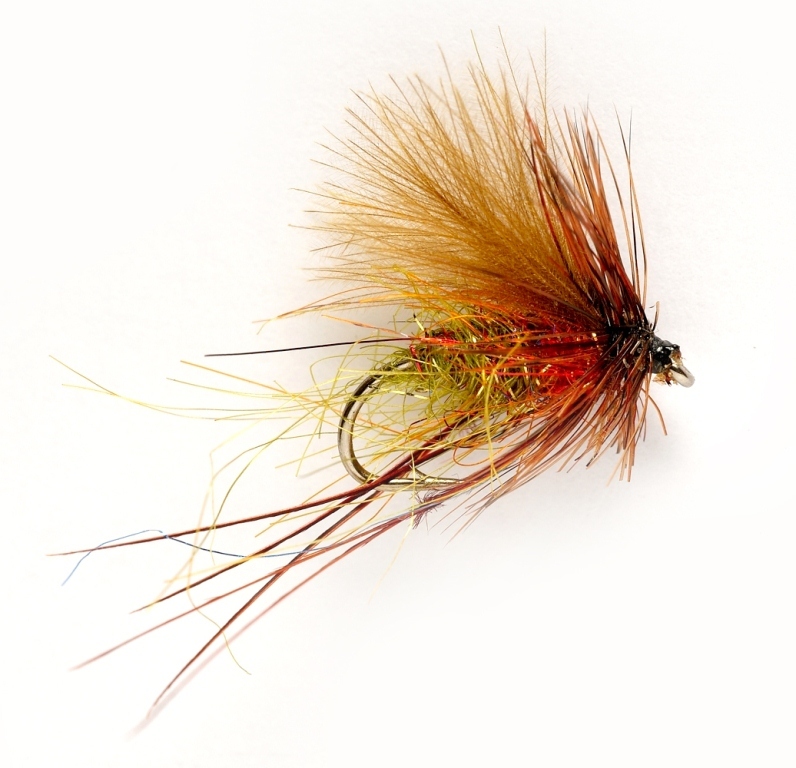 The second important thing was to keep flies absolutely static. 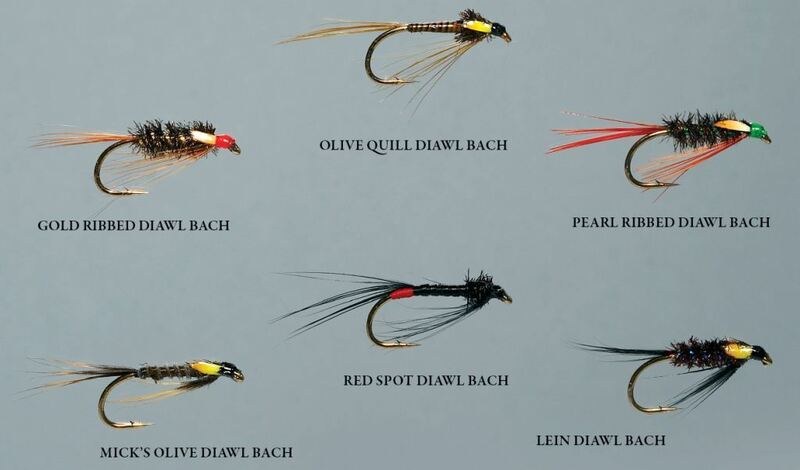 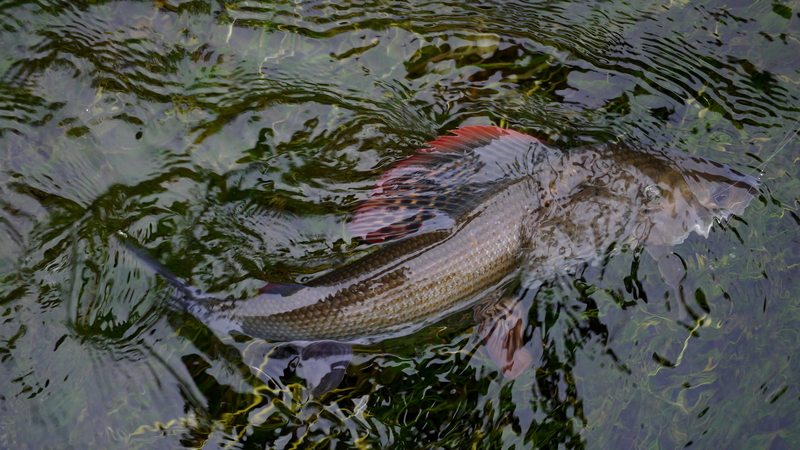 The selection of flies was less important, everything with red-holo pattern was good. 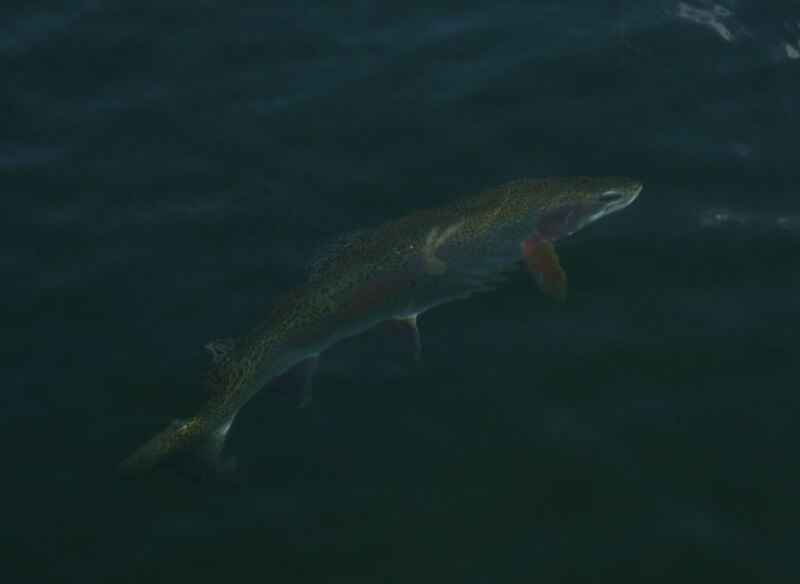 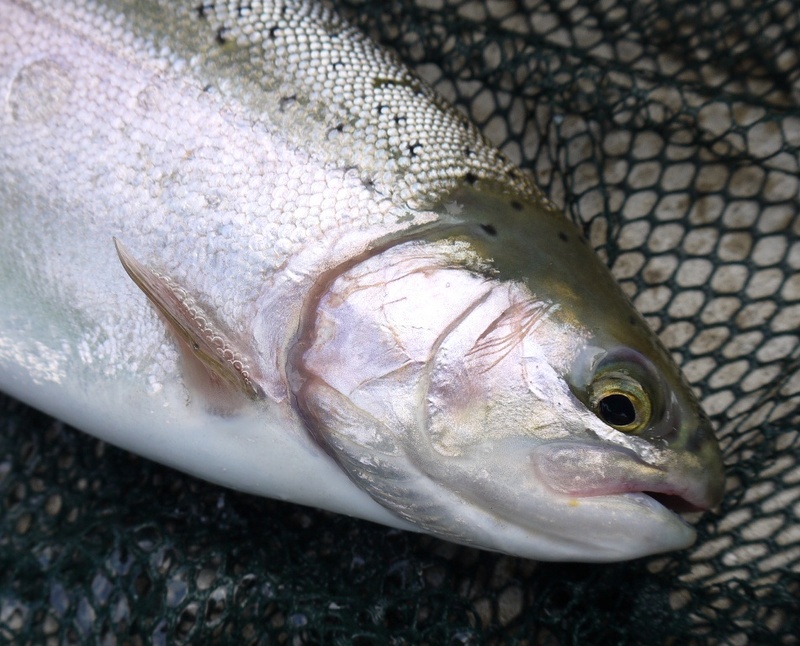 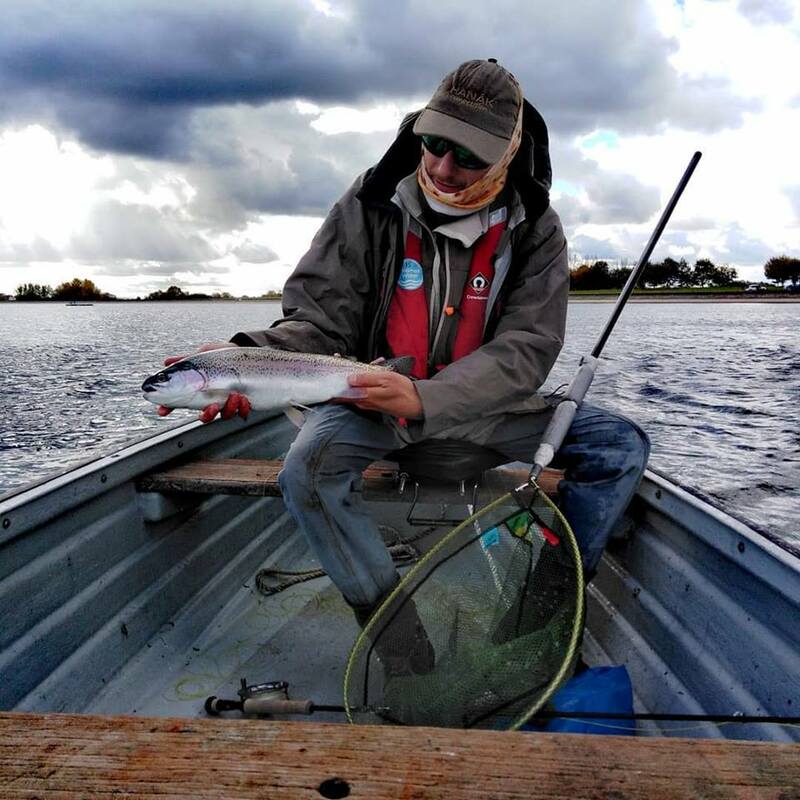 The most amazing surprise was waiting for us in the late afternoon when the wind dropped down and overwintered fish were rising through the flat surface everywhere but we were not able to catch them. 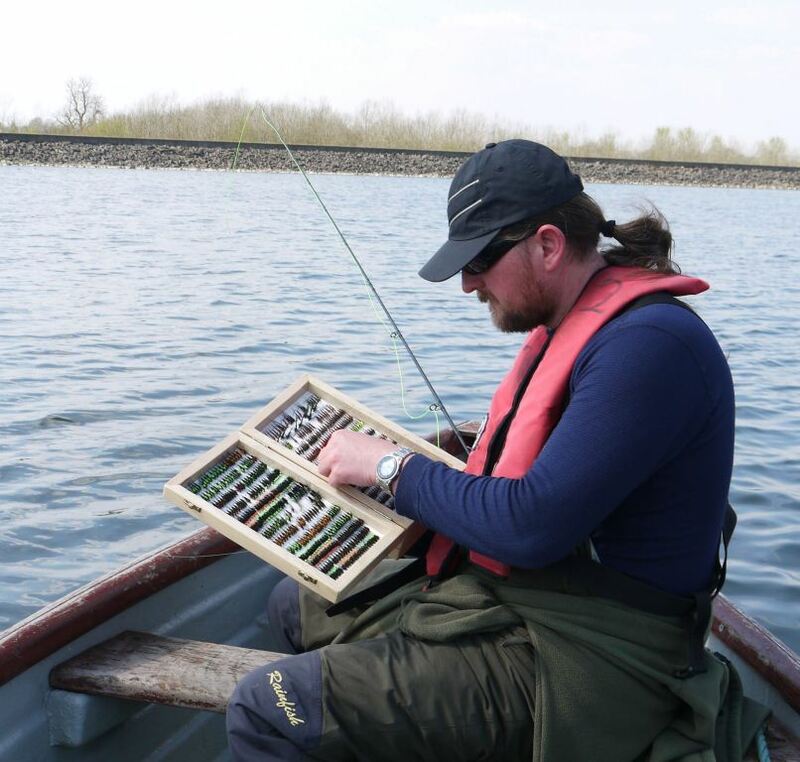 But it is fishing. 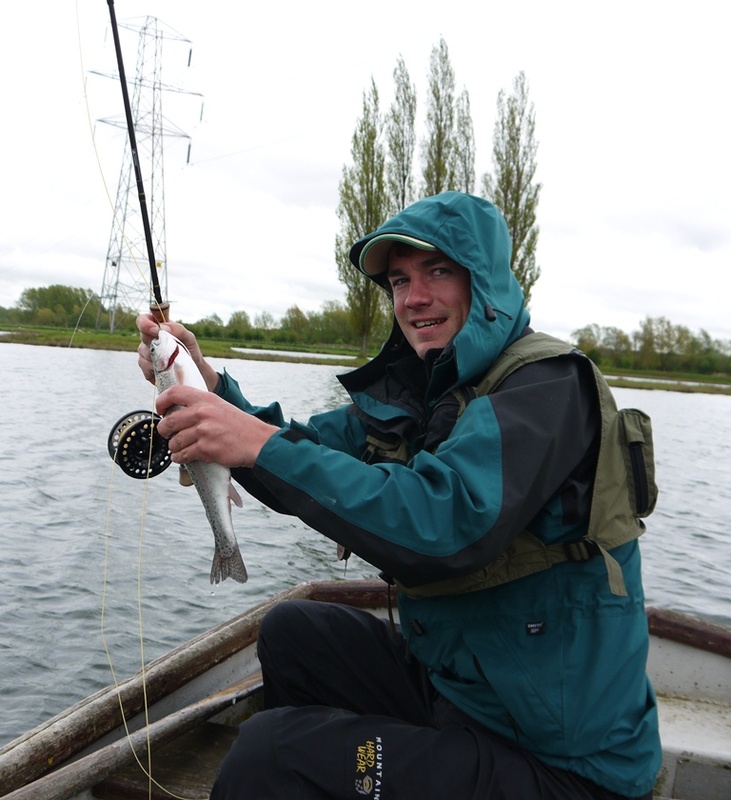 We finished the trip with “Fish & chips” in a Fish-bar in Rugby and few beers in Great Easton. 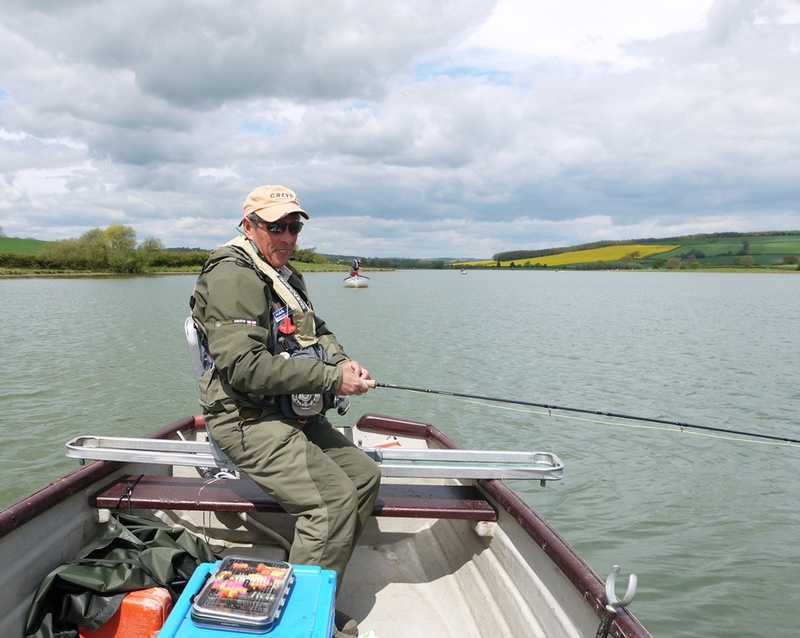 Third day we visited Ravensthorpe with John and Ben, it was simply amazing, crystal clear water, nice ripples, cloudy sky and fish taking both nymphs and lures, we enjoyed static nymphing from drifting boats (John is great teacher and I found, that in this technique is any detail in the construction of leader important as well as quality floating line) and also pulling lures, we caught over 150 fish including some browns, pike and also 8lb rainbow. 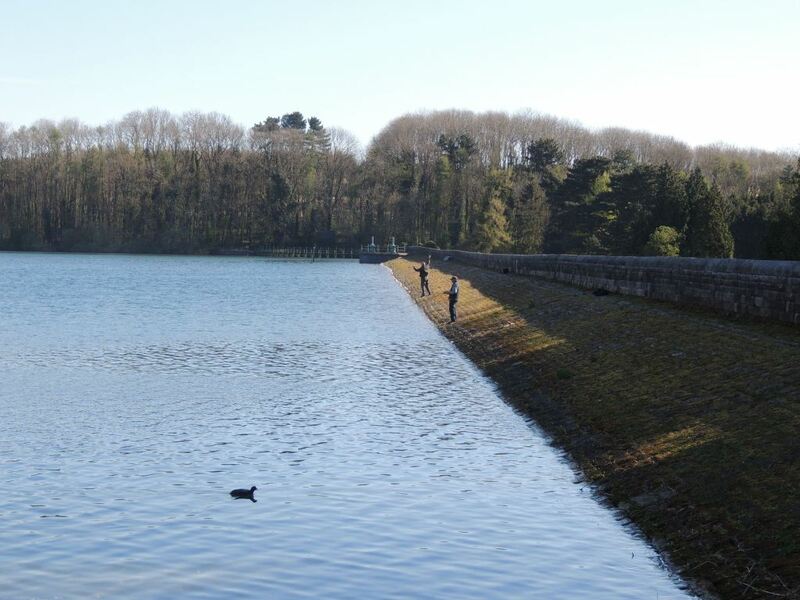 Well done Anglian Water. Last two days we spent in Eyebrook, lovely heavy stocked fishery with friendly staff never disappoint you, hatch of buzzers and a little green and heating water lifted fish up and we enjoyed nymphing with light flies, washing line method and also pulling on glass lines. 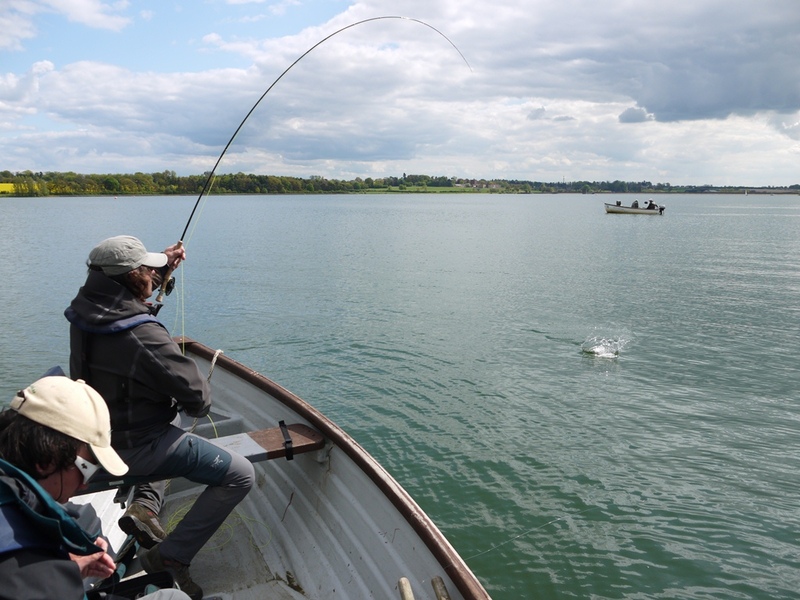 Relatively high fishing pressure resulted in a little higher precaution of fish and I estimated that we had 50 percent success rate of strikes. 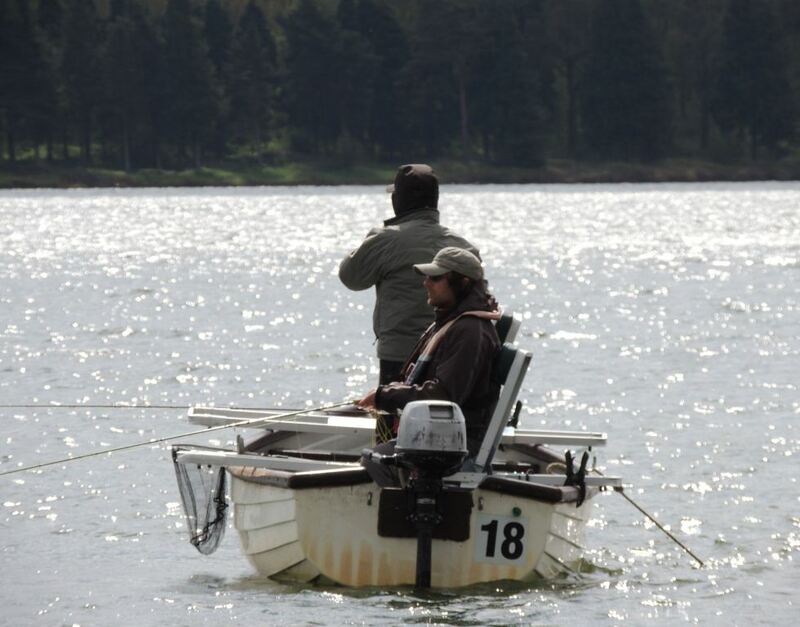 I guess we caught in five days about 250 fish and we are looking forward to next year. I visited England with two friends Paul and Ondra for 5 days fishing trip in the beginning of May. 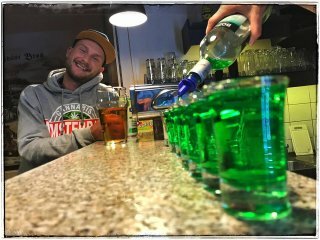 Lukáš, the last member of our group, got a horrible flu and could not moved, so he had to stay at home. 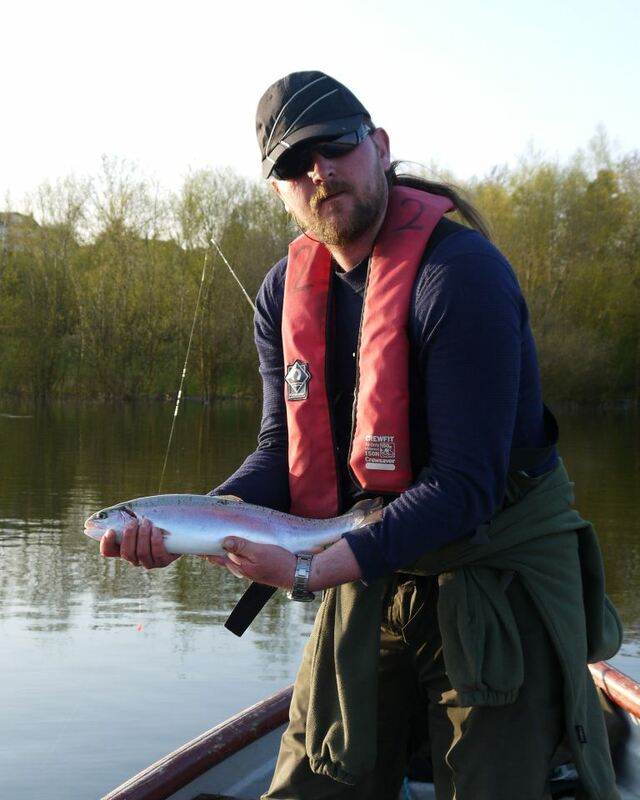 We flew to London Luton by WizzAir on 9th May, we left Prague at 6 o’clock and at 7 we were in England. 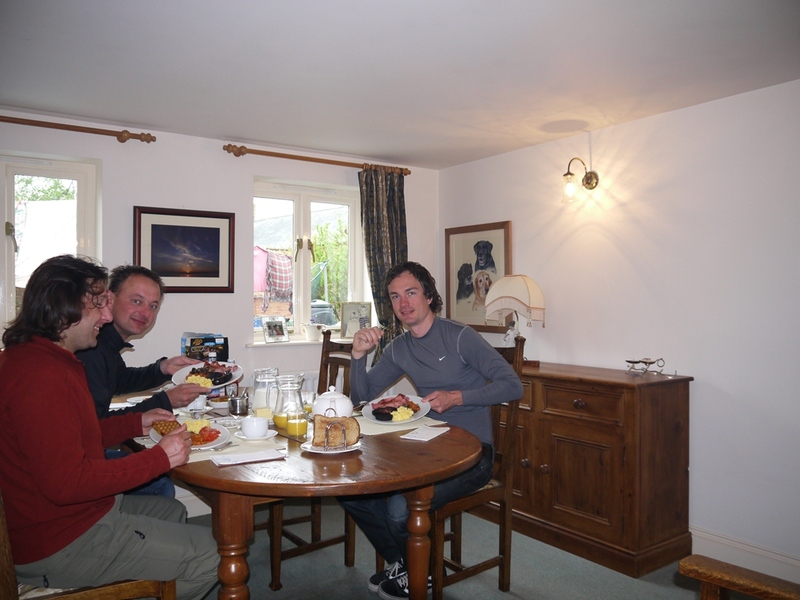 As we had problem to find easy-rent company and there was a traffic jam in M1 and my navigator had not such a great day, we reached our accommodation at Great Easton B&B relatively late. 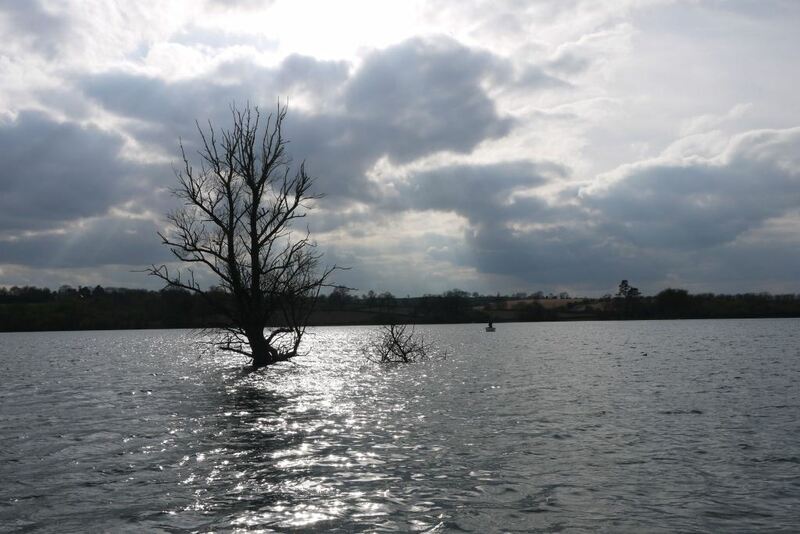 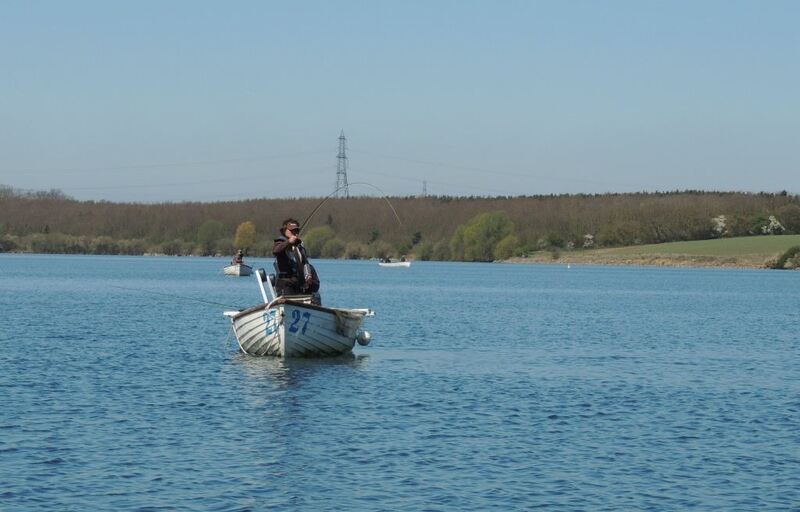 But we were sitting in boats on the Eyebrook Reservoir at about lunch time. 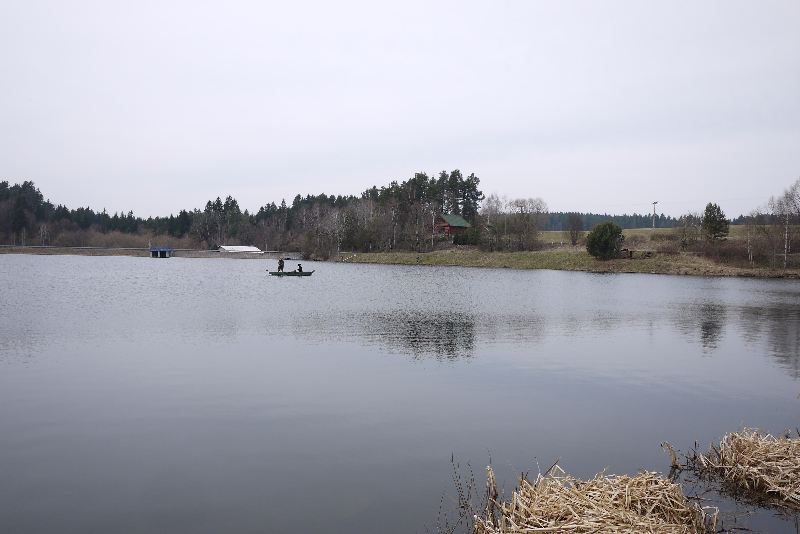 I have already visited this lake at least for 15 times, fishing is always good there, they have friendly staff and good shop. 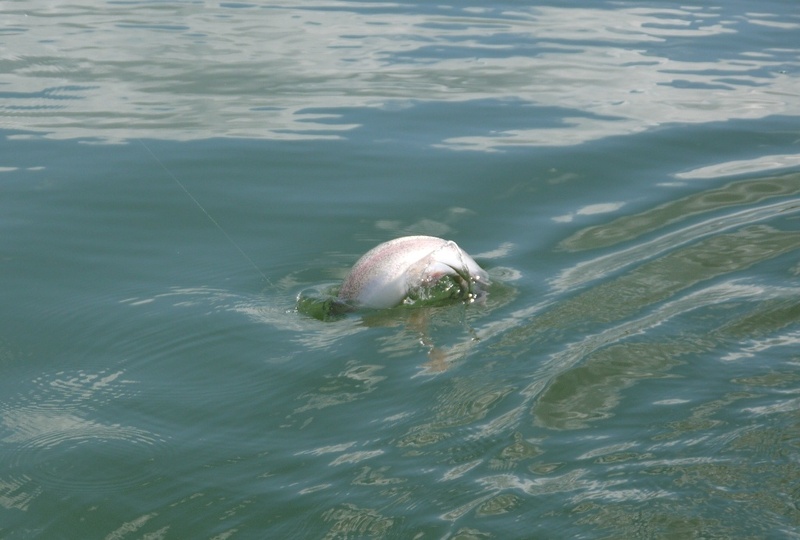 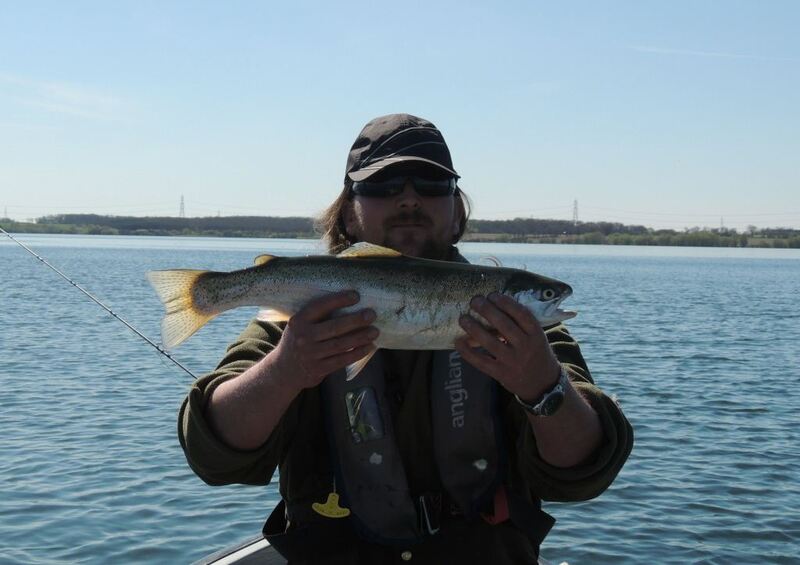 Lake has in my opinion ideal size and location and it is always full of fish. 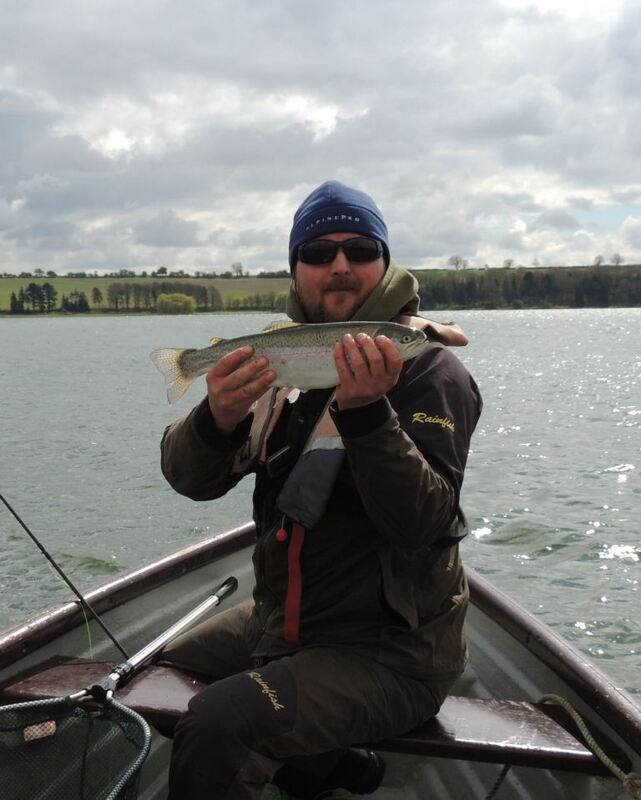 It was rainy but buzzers were hatching and fish were active, so fishing was good, I was fishing washing line and team of 3 smaller black buzzers and booby on the point and I covered rising fish or simply cast to the bank and fig.8. 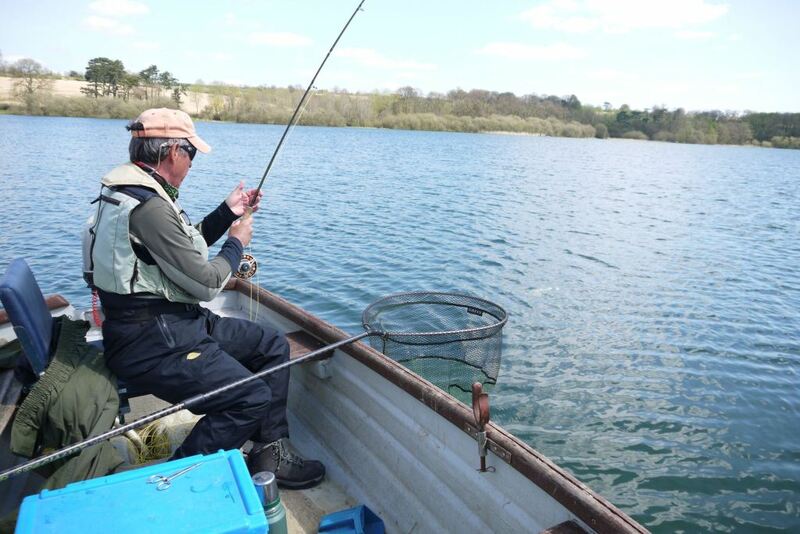 When I got soaked I made break for coffee and small talk in the lodge, owner of the fishery Andy told me, that lake (similarly like other lakes in England) was low after long drought and it was filled up during last week, so it was full of fresh water rich in nutrients. Finally we got altogether over 20 fish, so it was good start. 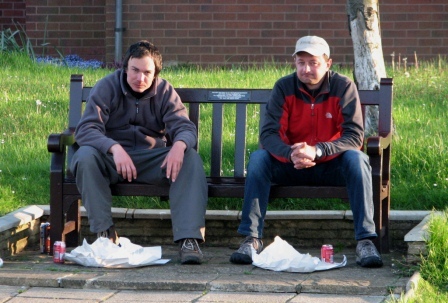 In the evening we went for two beers and 1 Cola the local pub in Great Easton (Paul don’t drink alcohol – he is veg and don’t drinks, poor Paul, he has nothing funny in his life ). 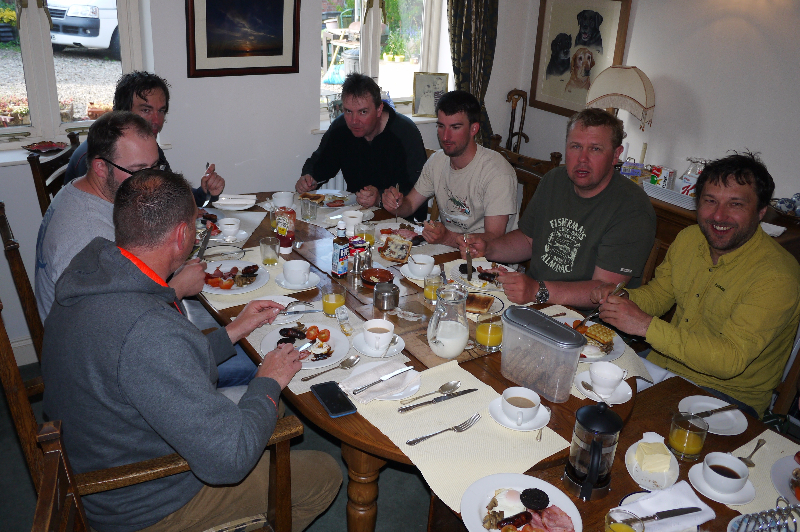 After perfect full English breakfast (Paul had full English veg-breakfast we went to Elinor fishery which was recommended to me by Mick O´Farell. 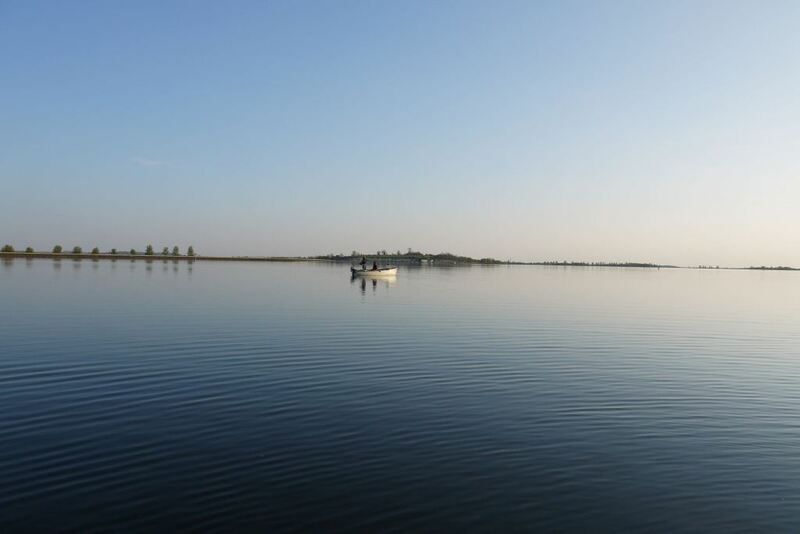 I changed navigator, but it was again nothing special, 15 miles long journey took 1,5 hours. 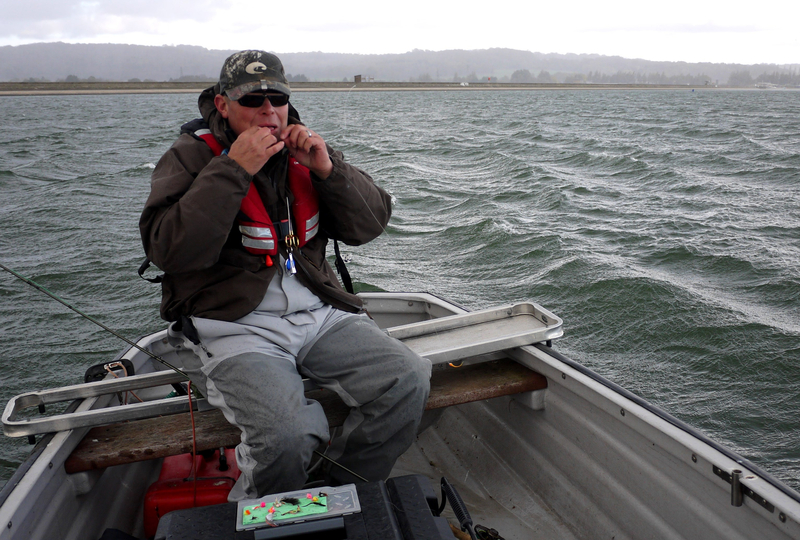 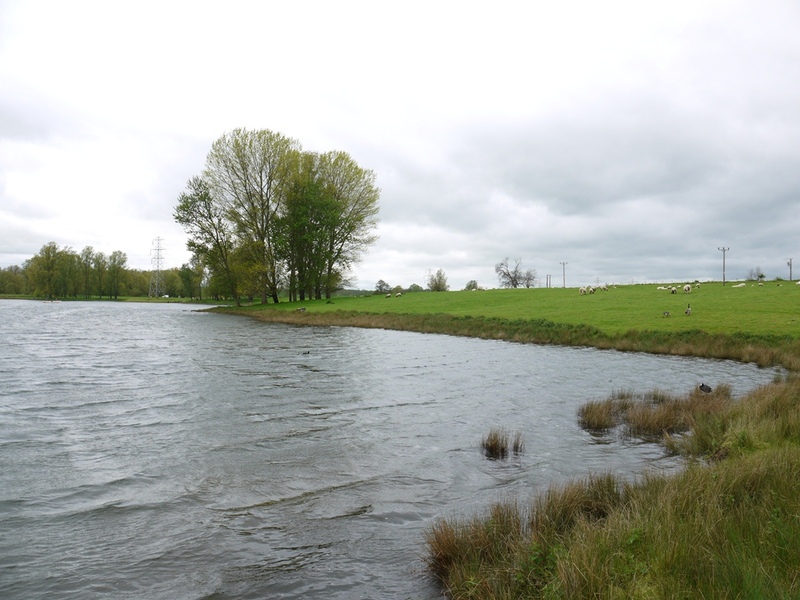 This 25 acres lake welcomed us by strong western wind and owner recommended to us bank fishing. 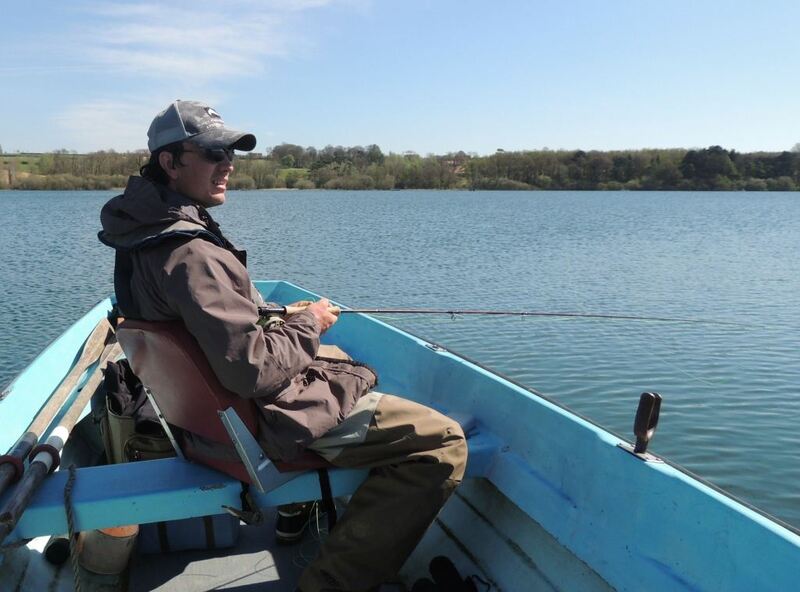 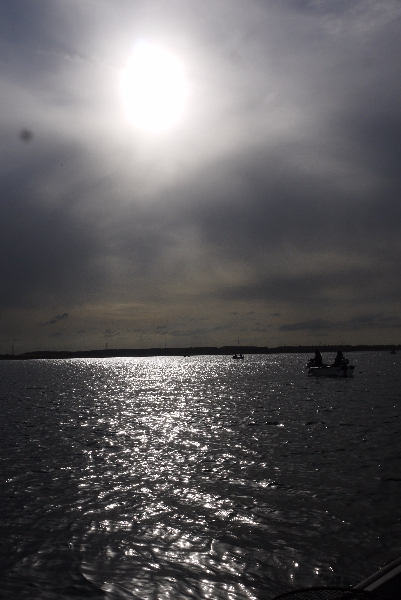 But it was wasting time as fish were rising out of casting distance and we rent the boat for the afternoon. 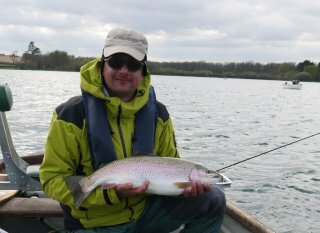 We were three in boat, it was good idea, Paul is left handed, so it was no problem for casting and more flies in water brought more fish, we caught over 30 fish. 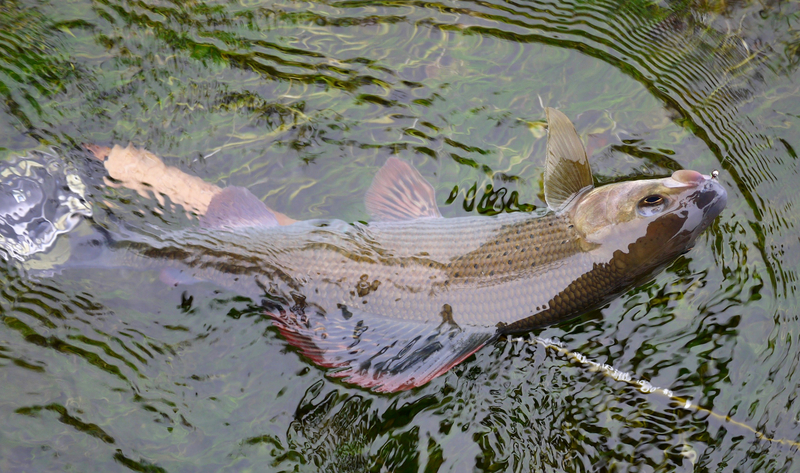 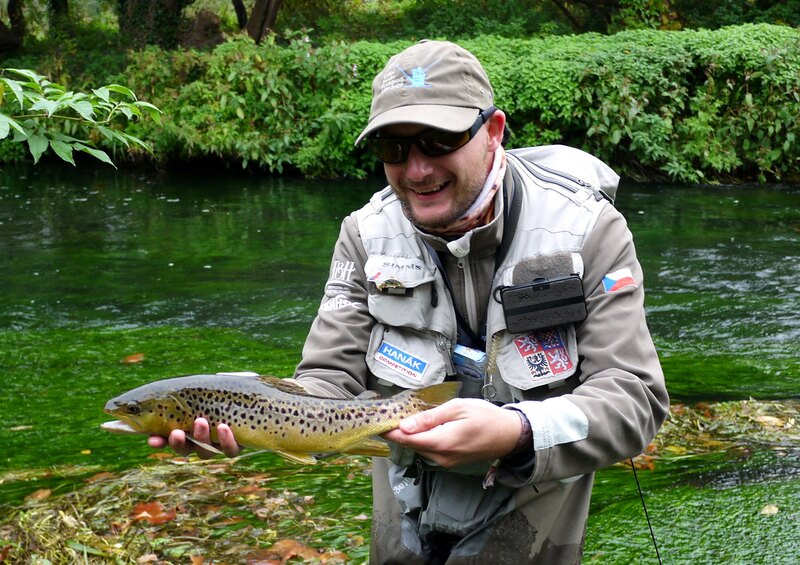 The best method was fishing light flies just under surface, best pattern were claret and black hoopers and different smaller DB. 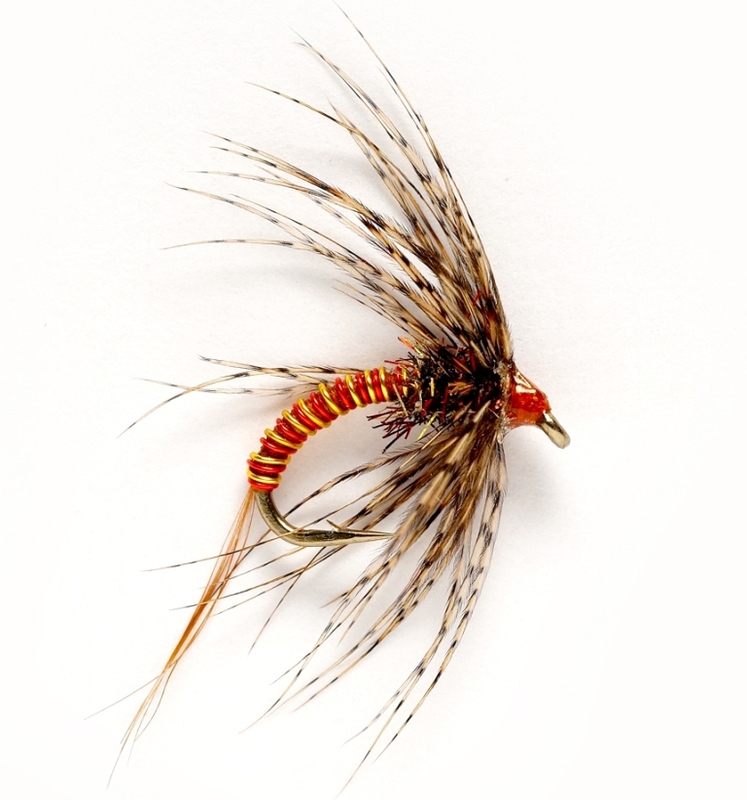 I got also some fish on nymphs in the deep and one on tequila blob. During the way home we stopped for dinner and a few beers in Pizza restaurant at the intersection close to Eyebrook, Paul ordered veg-pizza with paprika sausage. 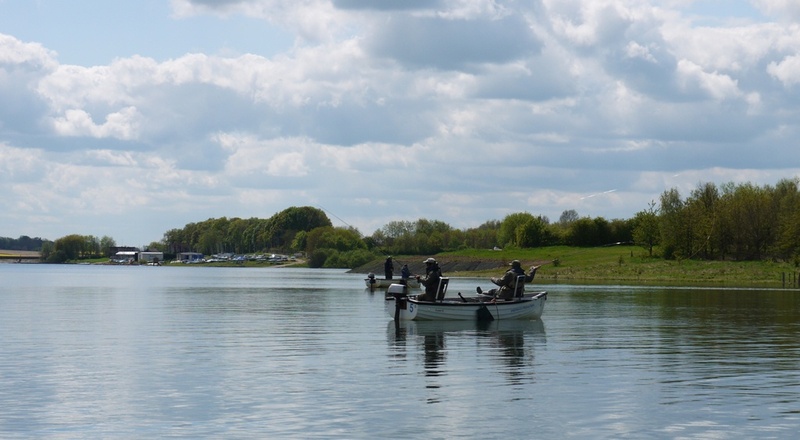 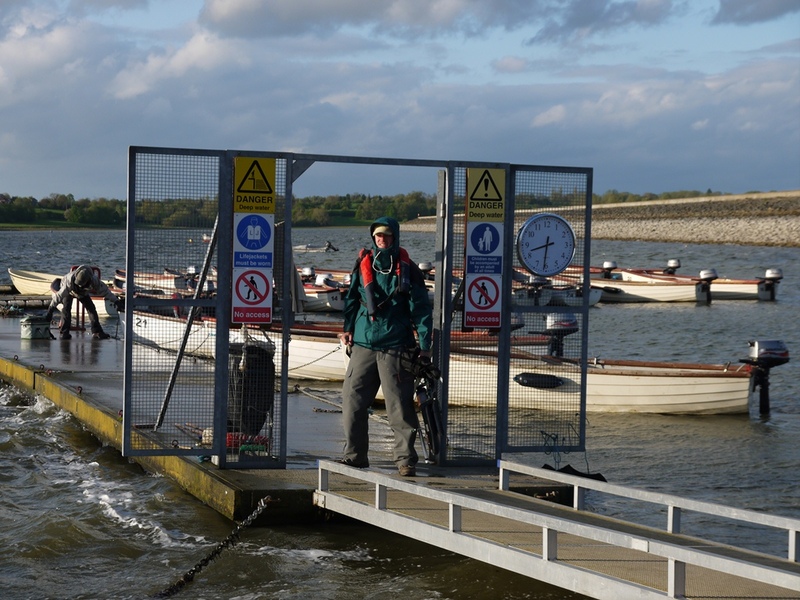 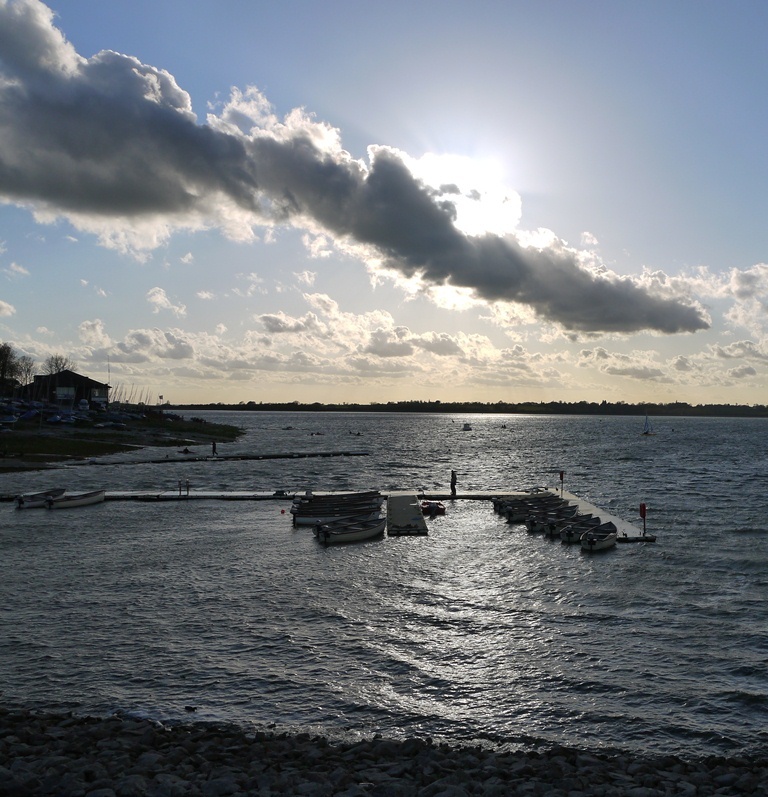 On Friday we went to Draycote Reservoir, Craig Baar had nice new shop and it was visible, that he works on the improving of fishing facilities. 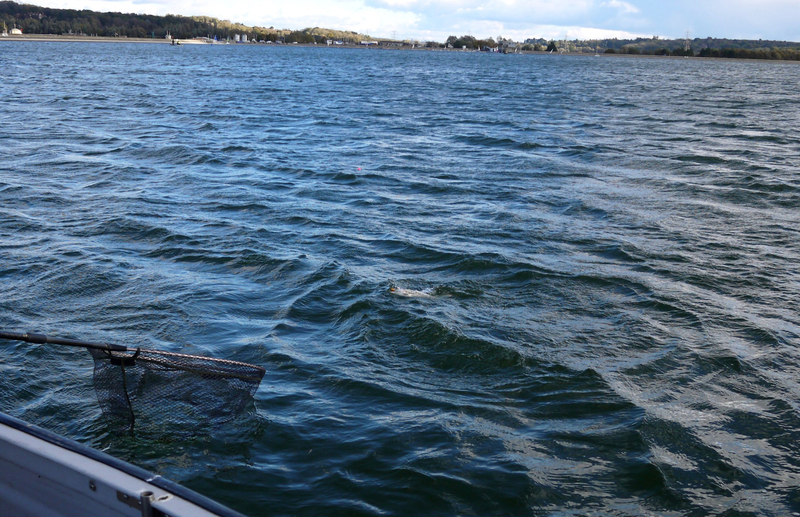 Wind was stronger and changed its direction to NW, so there were 1 m high waves at the dam. 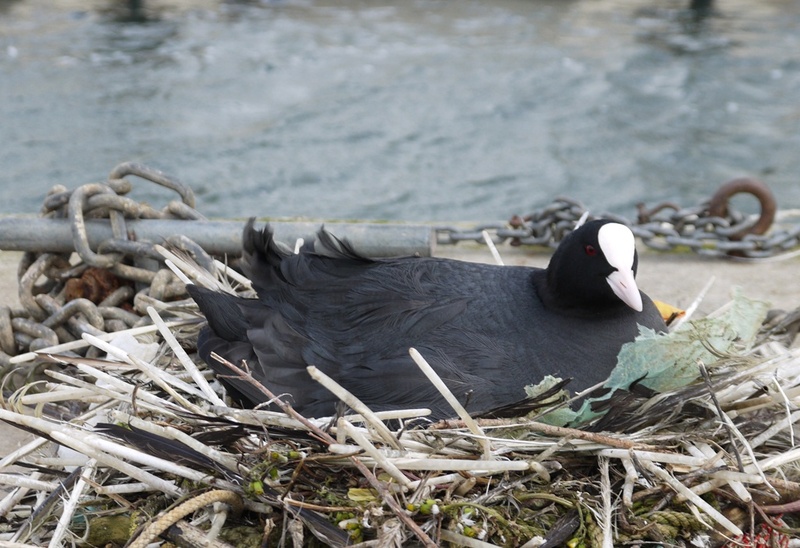 In the jetty was everything supervised by nesting coot. 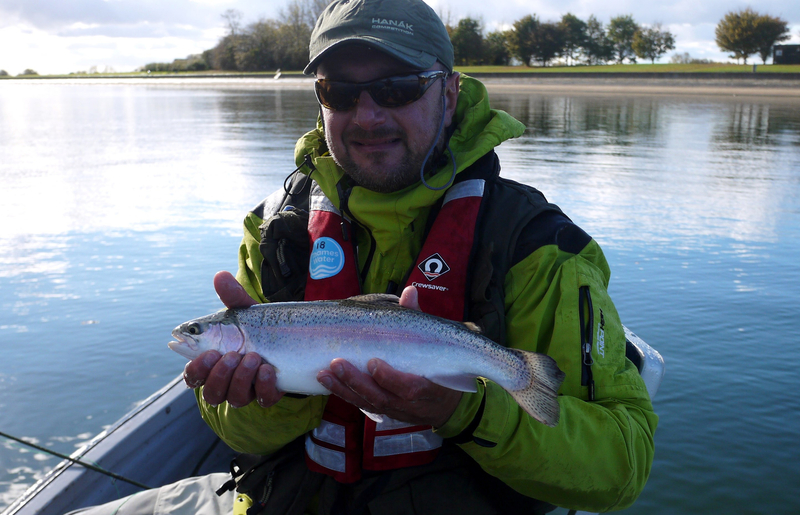 The best method was again to anchor in a sheltered place close to bank and fish nymphs on midge tip line, very good was buzzer with red-holo rib and cheeks which we got from Craig. 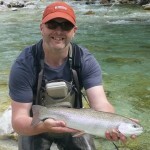 Relatively hard day I finished with 6 fish and few missed takes and one snapped bigger fish, my friends had similar result. 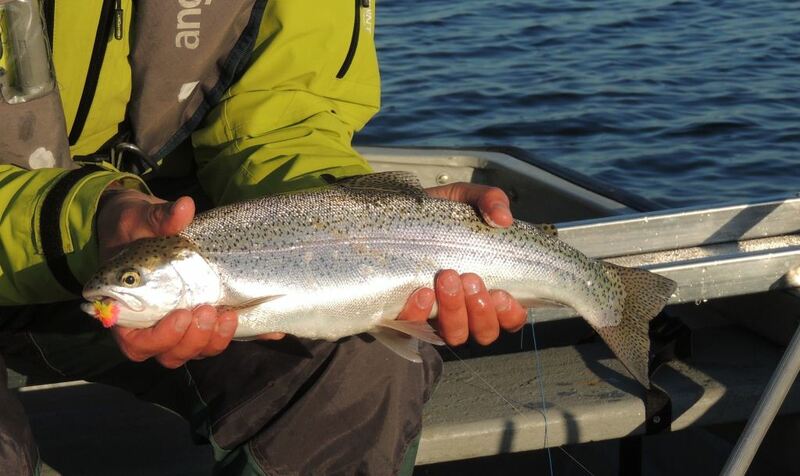 We got few nice silver overwintered fish. 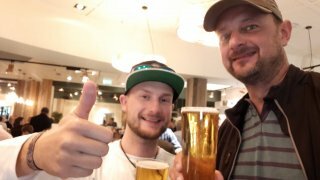 After we came to Great Easton, we again visited pub to support the local business, I liked the local bitter beer, but Paul ordered another Cola. 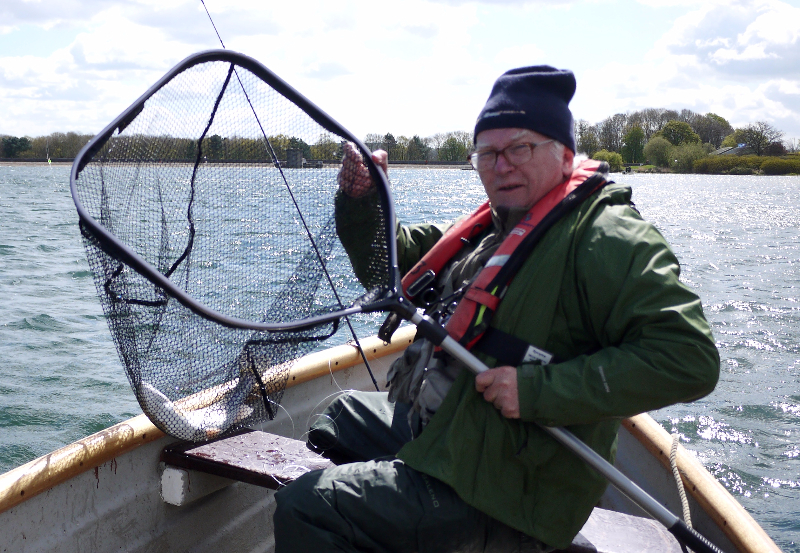 On Saturday we were fishing Pitsford Reservoir , after 2 hours of drifting without any take we anchored in a bay close a small group of boats and we caught 7 fish in 15 minutes including decent pike, all on midge tips and damsel nymphs. 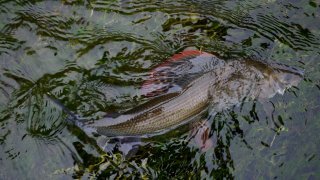 Next another boat anchored in front of us and disturbed fish, they left after short exchange of views but damsels did not worked more. 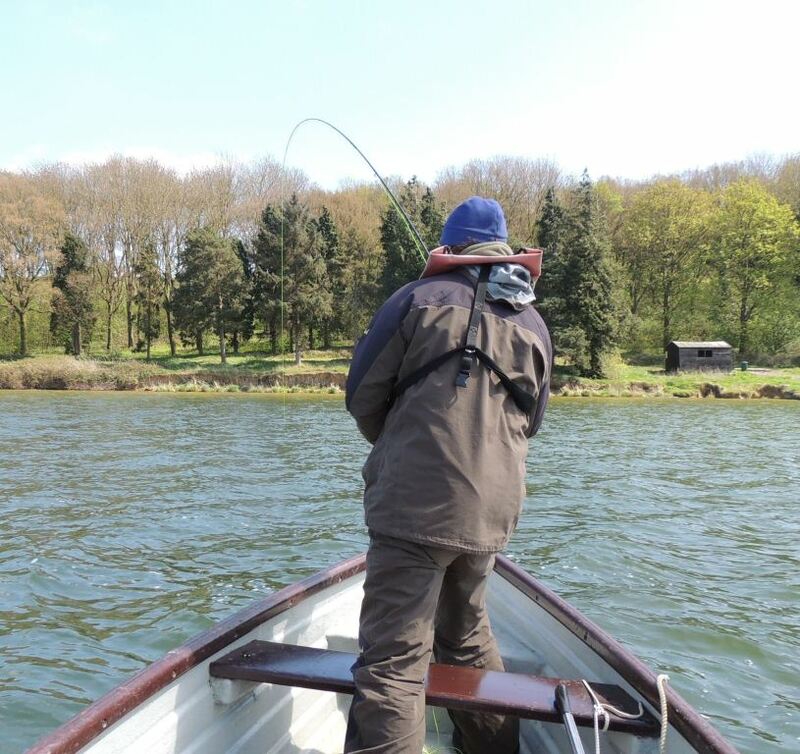 Fish were back after 30 minutes, but they took only buzzers and DB, it was necessary to fish as slow as possible and close to bottom, the best was to comb weed by the point heavy buzzer and fish took DB on the dropper. 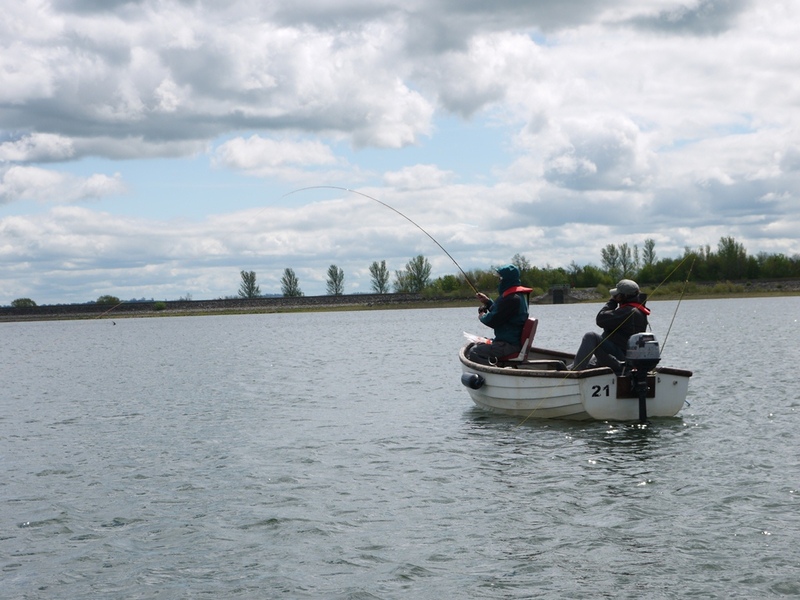 We were again three in the boat and it was great fun, we caught more than 30 fish. 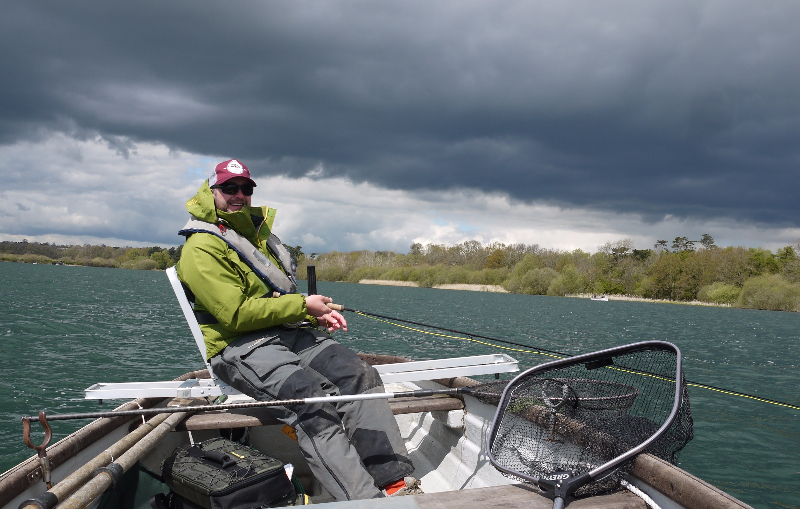 But it was one boat in front of us which got twice more fish and in my opinion the reason is that our boat with three people moved in the wind from side to side and therefore we were not able to keep our nymphs static. 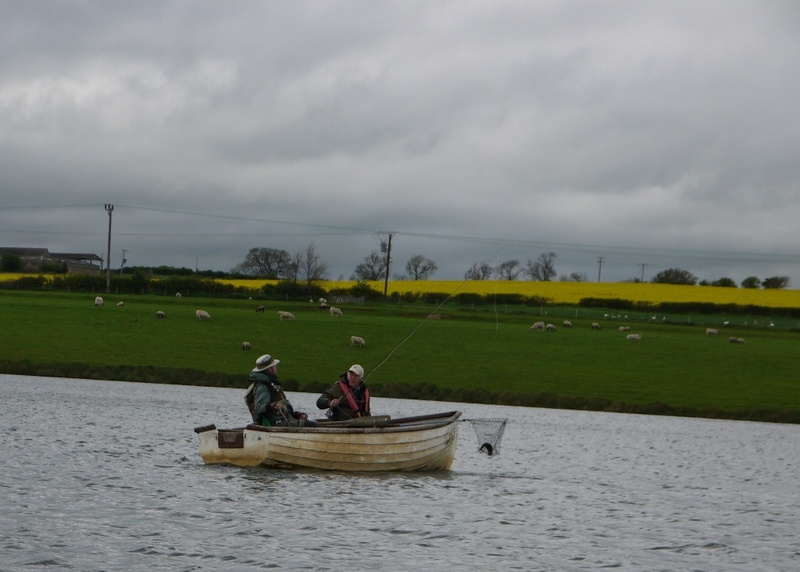 After great fishing we visited Fish-bar in Brixworth and bought “Fish and chips” and ate it at the bench in front of the bar like homeless. 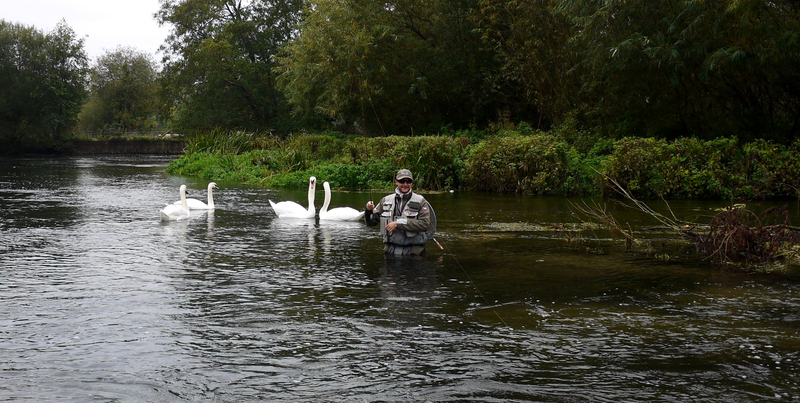 After we arrived to Great Easton we went directly to pub and ordered three beers. 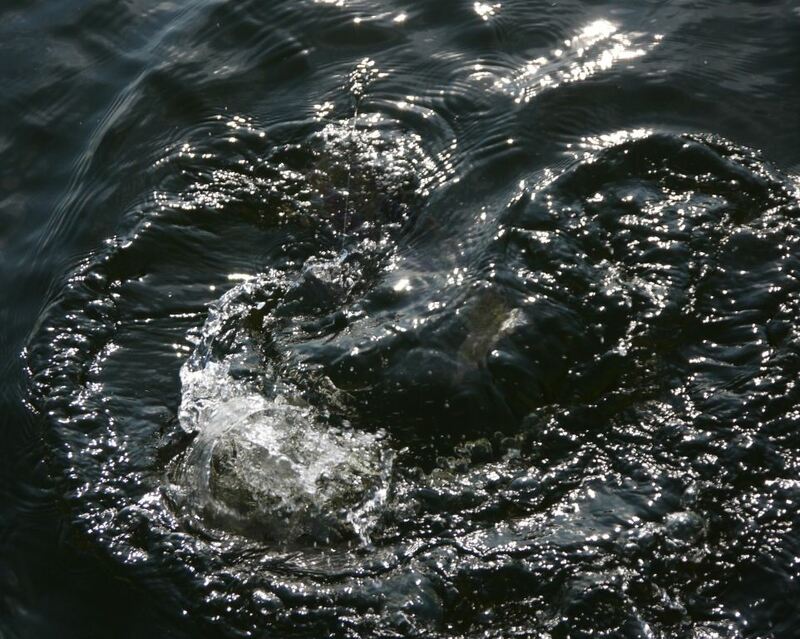 “No more Cola? 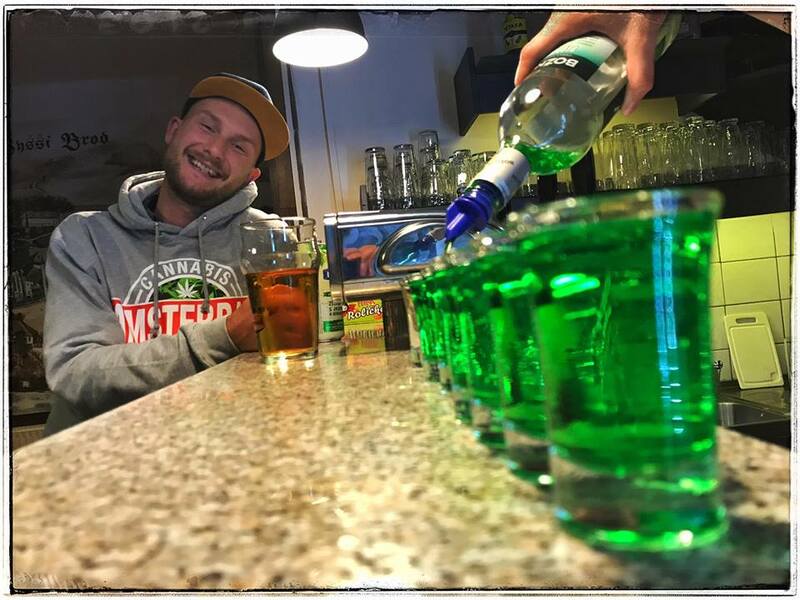 ” asked the waitress :-) . 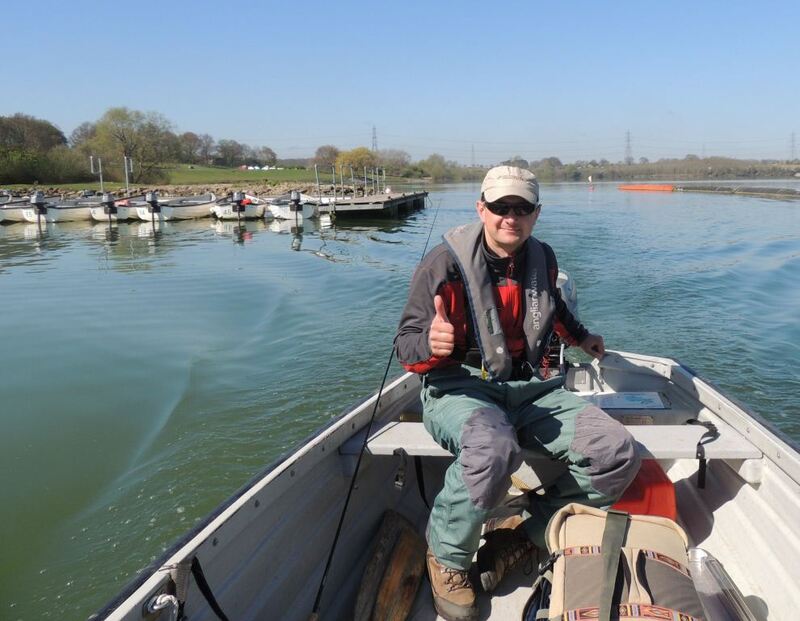 We finished our trip again in Eyebrook, I was in boat with my friend John Emerson. 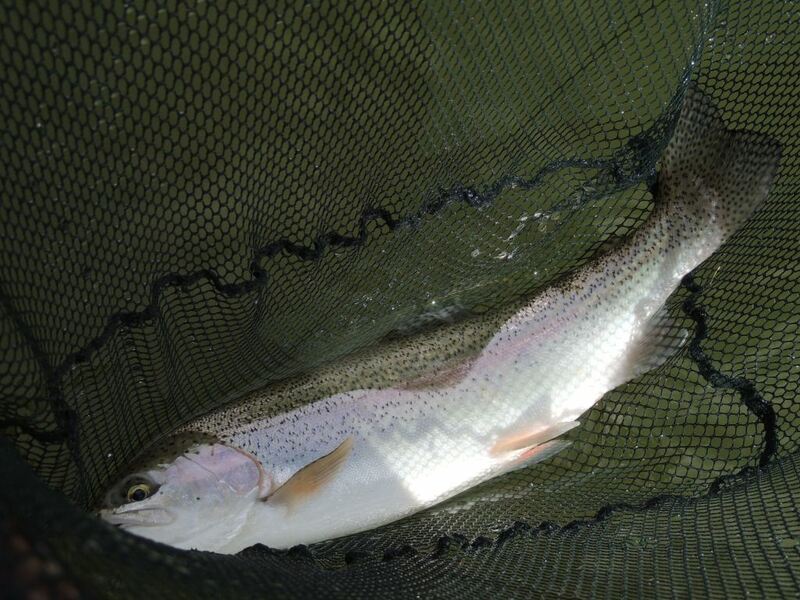 Clarity of water decreased to the half comparing to Wednesday because of water bloom, it was sunny and very windy, so nothing special for fishing. 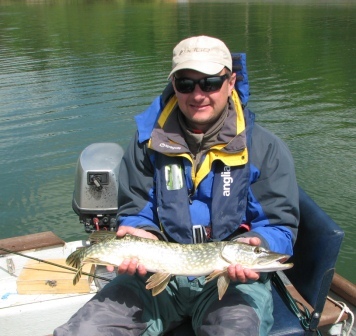 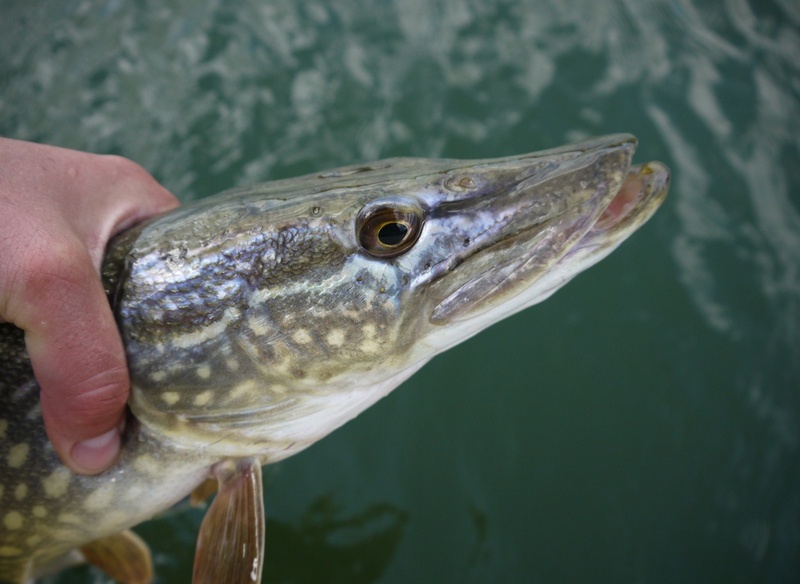 Fish were not active, I got 4 fish on TL Buzzer and the huge pike, John put Cat-lure to the point and got 6 fish on it and smaller pike, he told me, that fish did not feed, so it was necessary to try something to provoke them. 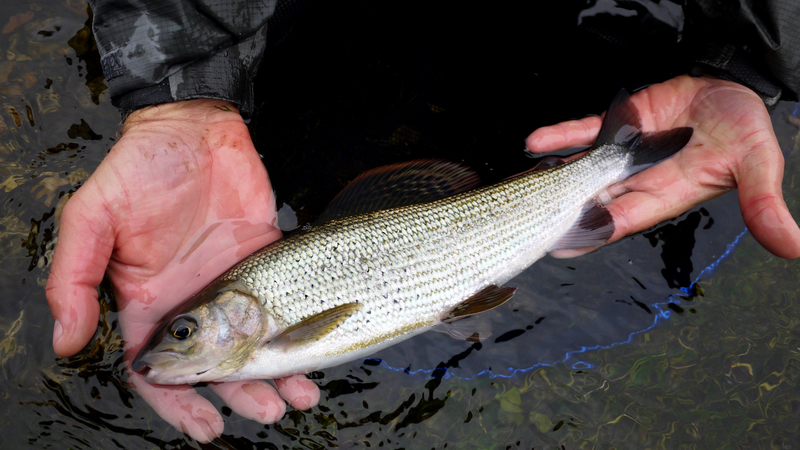 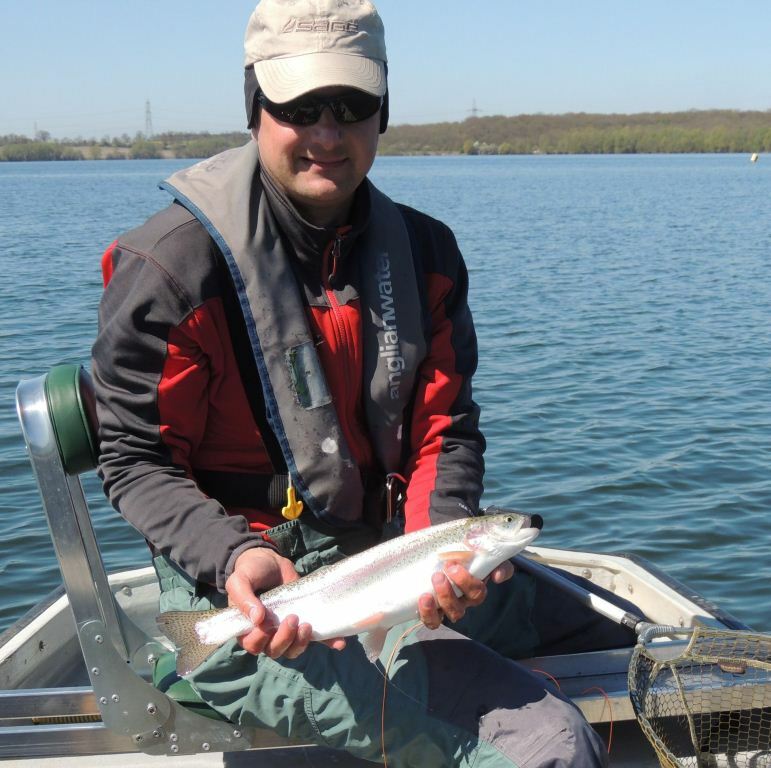 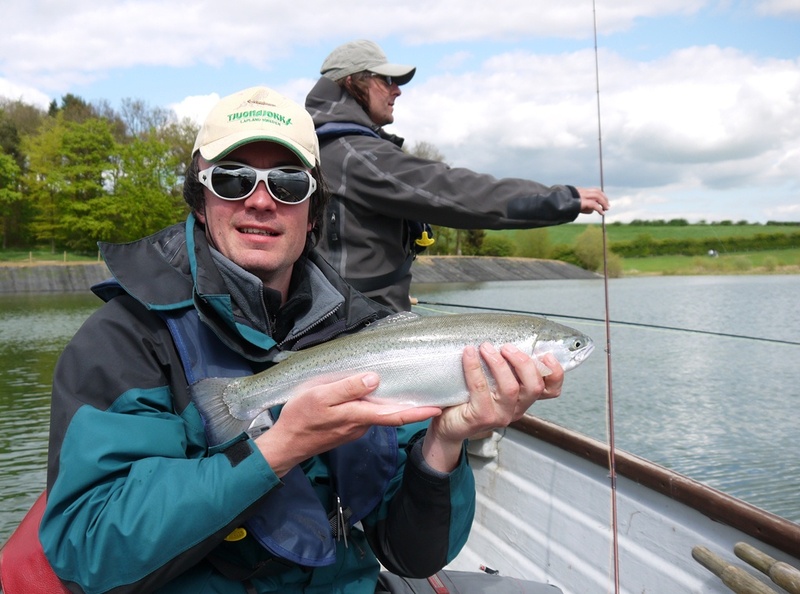 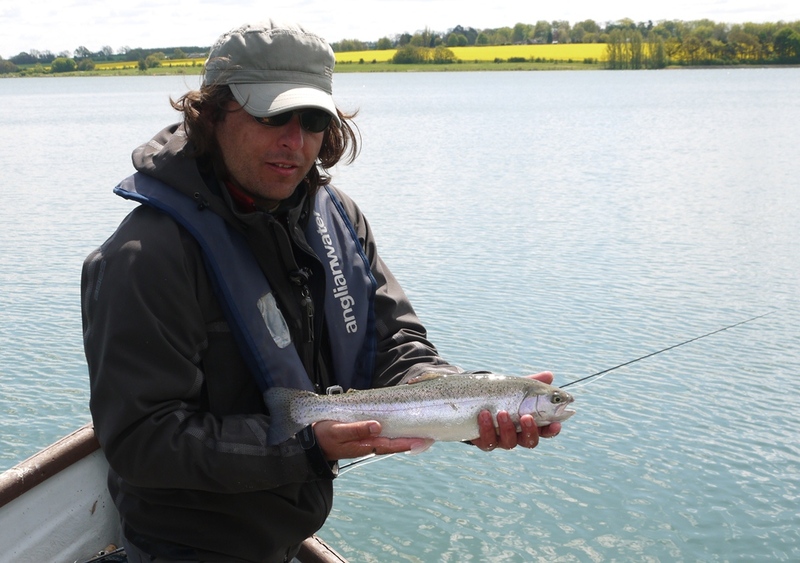 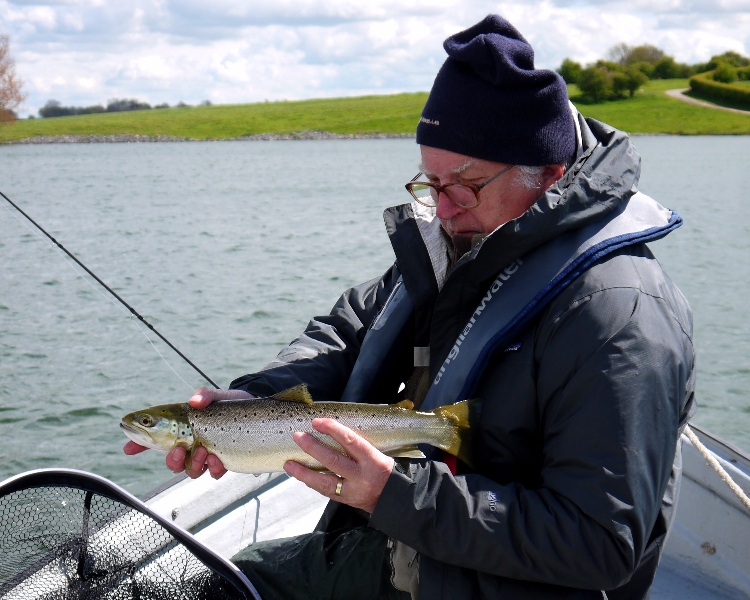 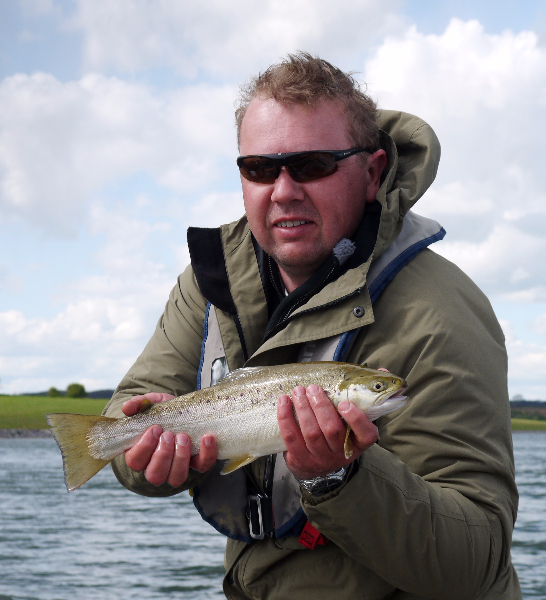 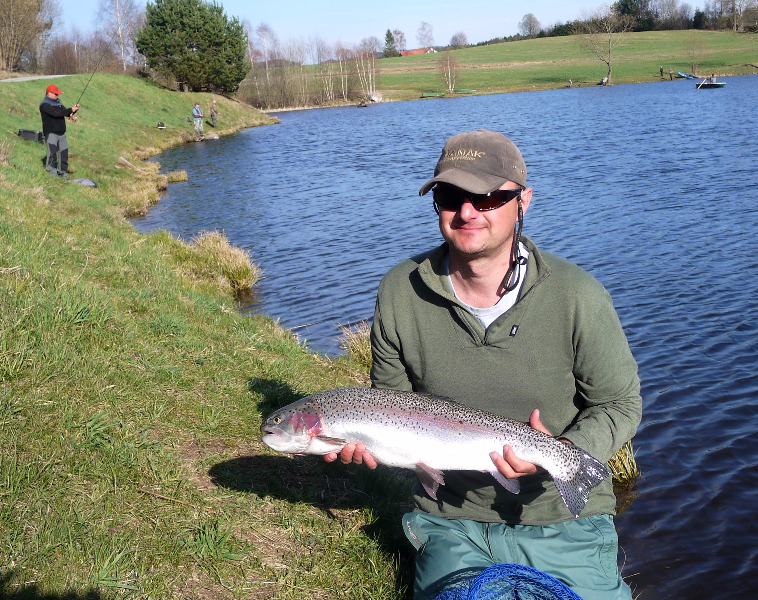 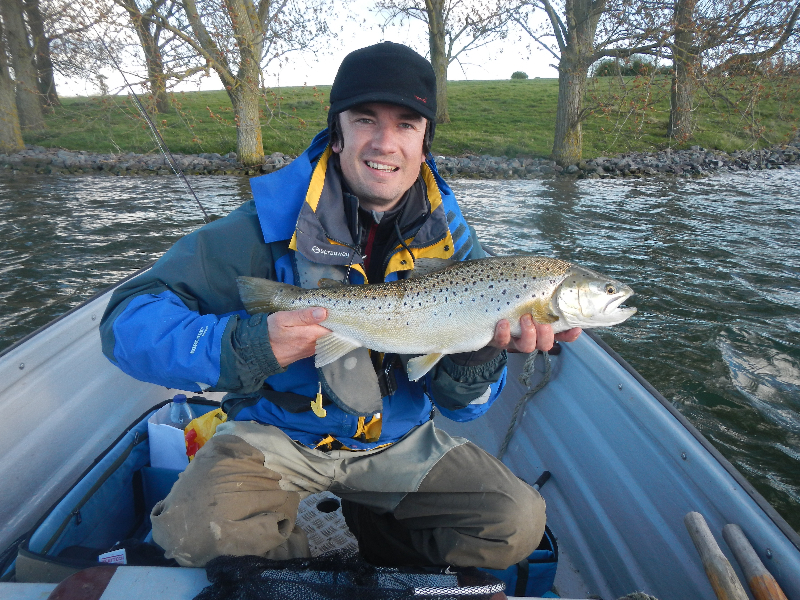 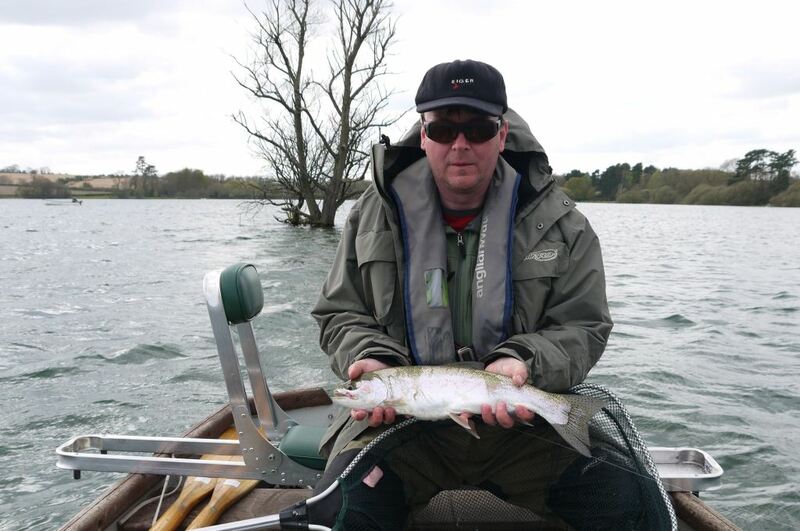 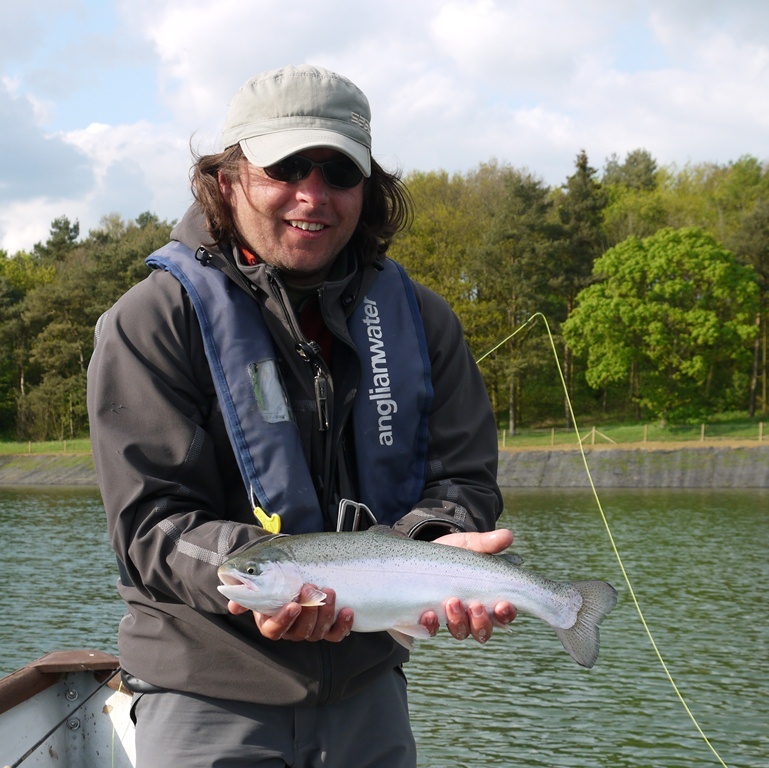 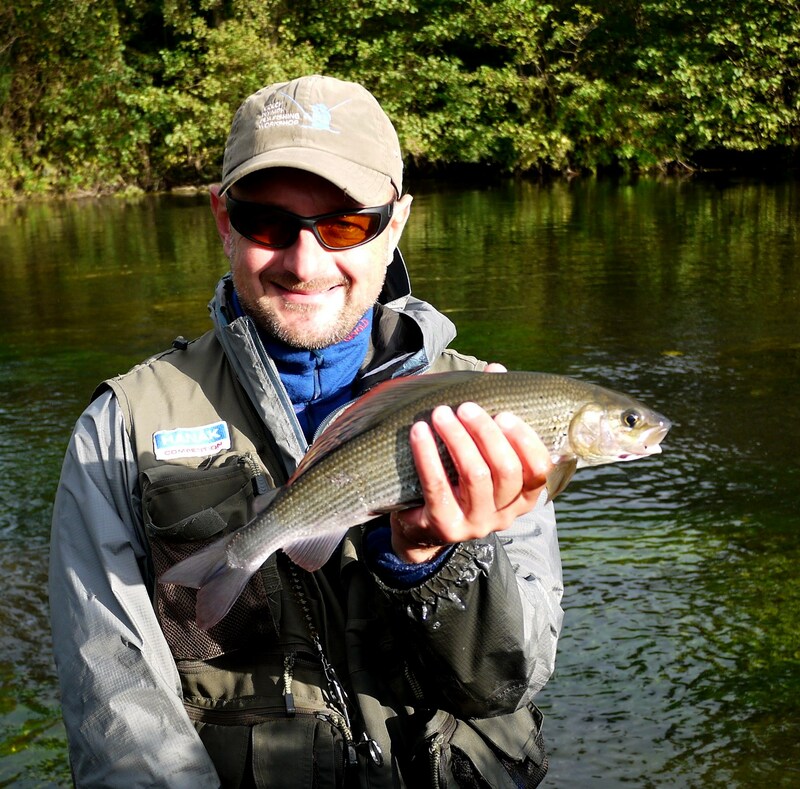 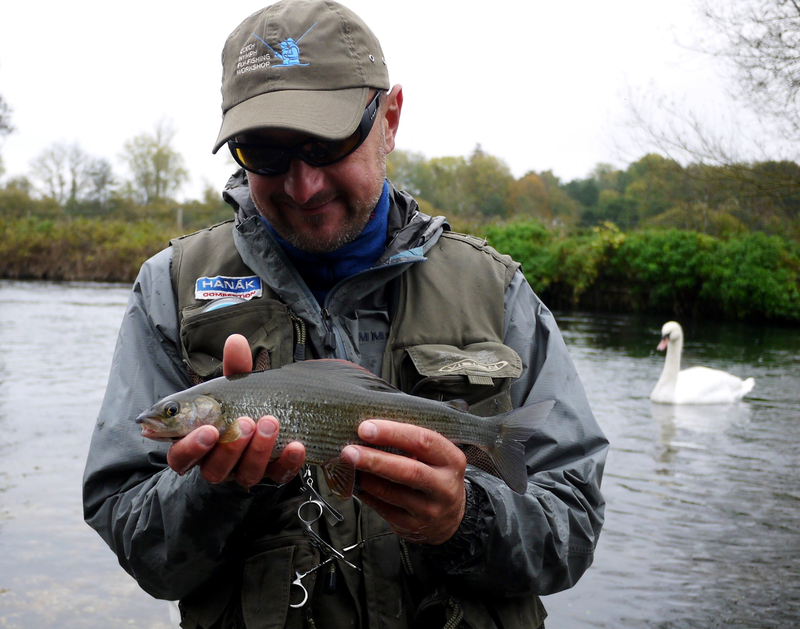 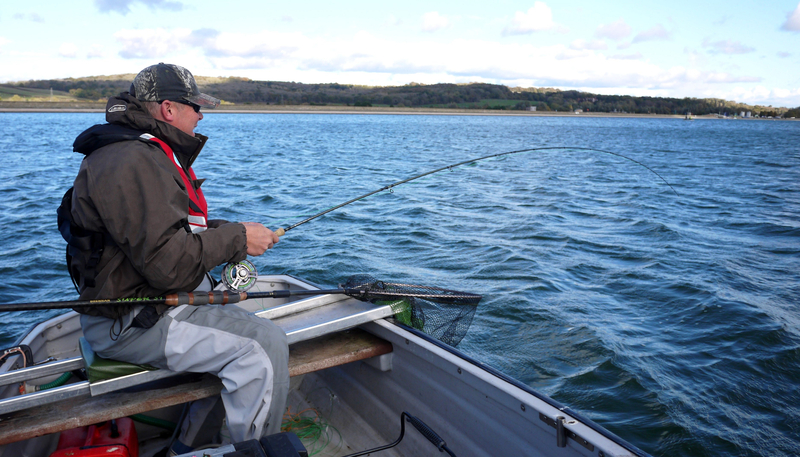 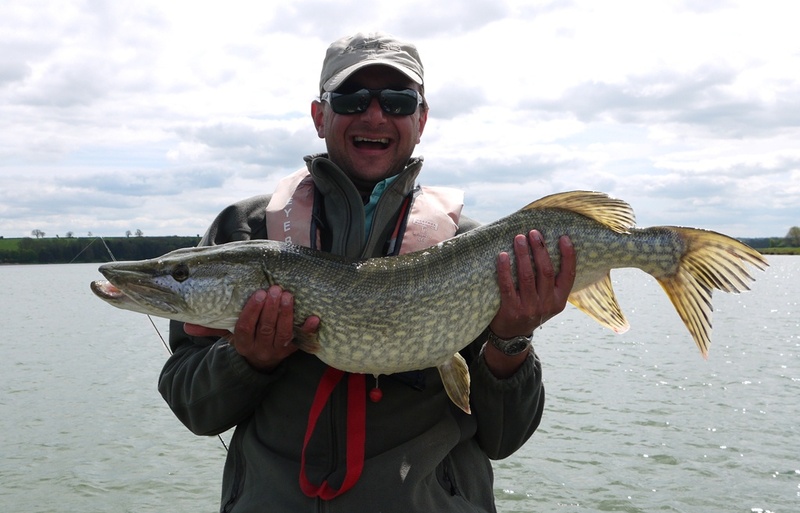 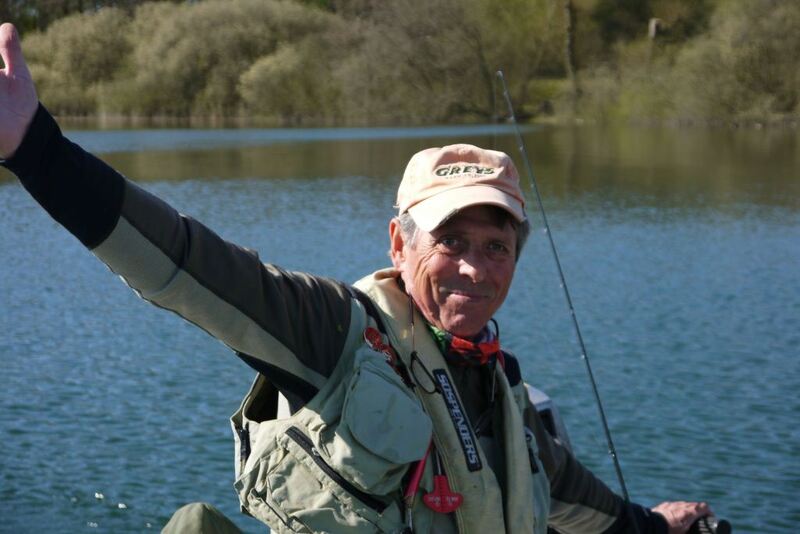 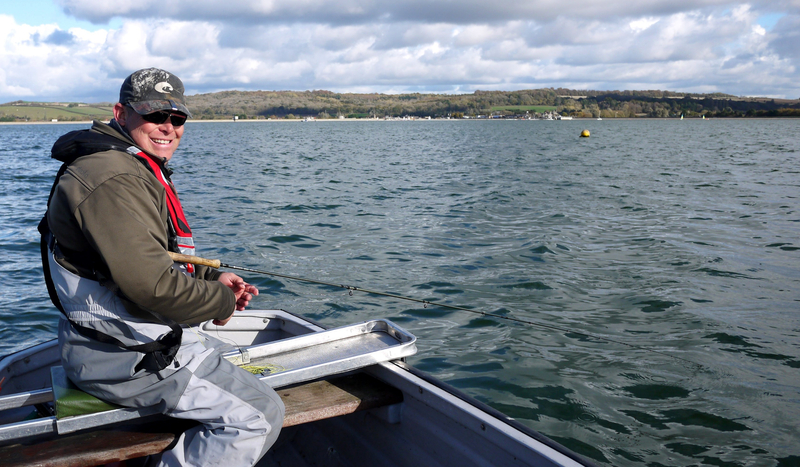 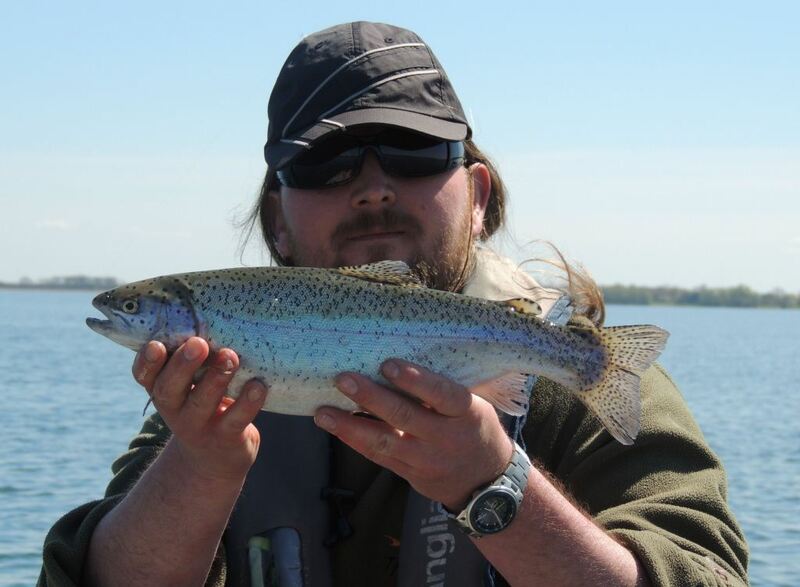 If you would like to find a good guide for fishing in lakes or rivers in UK ask John, he is very experienced angler. 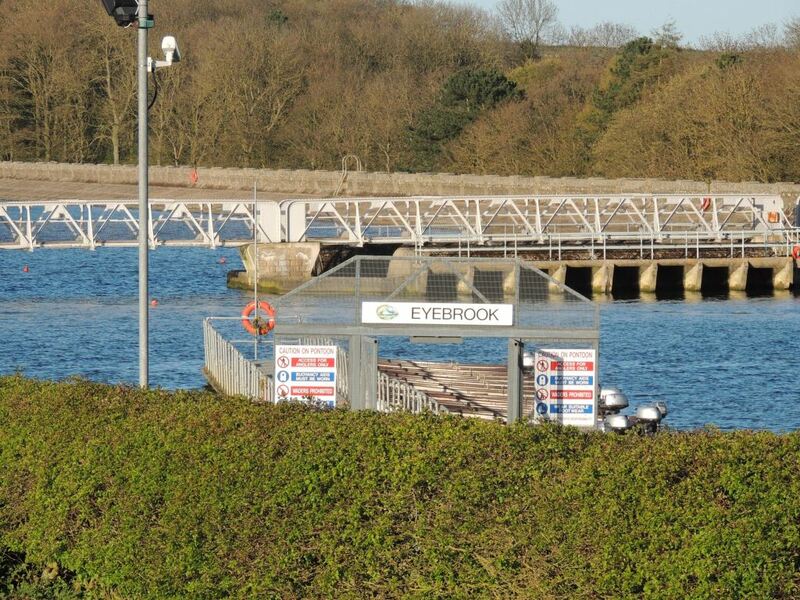 We had to leave Eyebrook at 3 p.m., pack our things in the BB (it was absolutely perfect accommodation in low price located 5 minutes from Eyebrook, we felt there like at home, Eleine and David Hankey were great hosts) and directed to the London Luton and we landed in Prague exactly in the midnight. 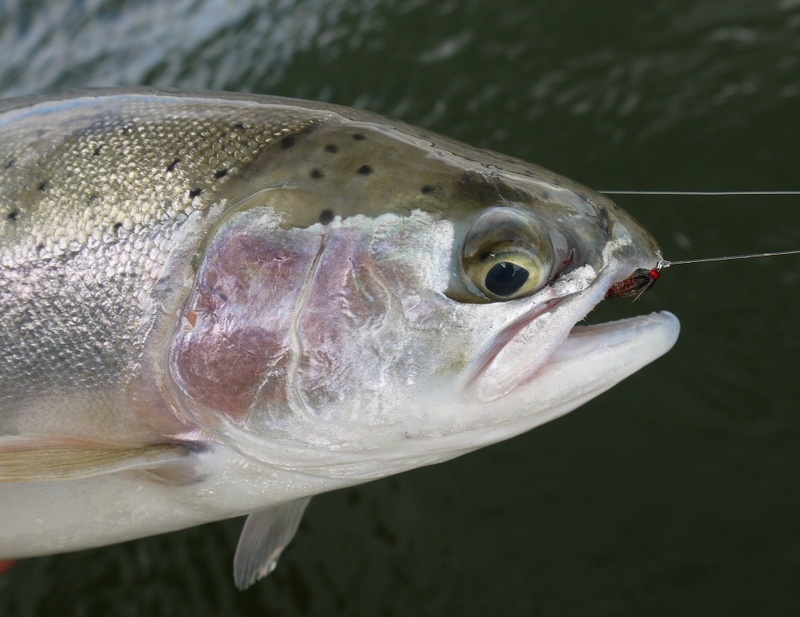 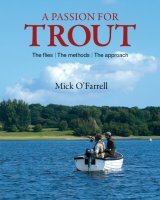 My friend Mick O´Farrel published very interesting book titled “A Passion for Trout” last year, which covers his long term experience from fishing for trout both in rivers and lakes. 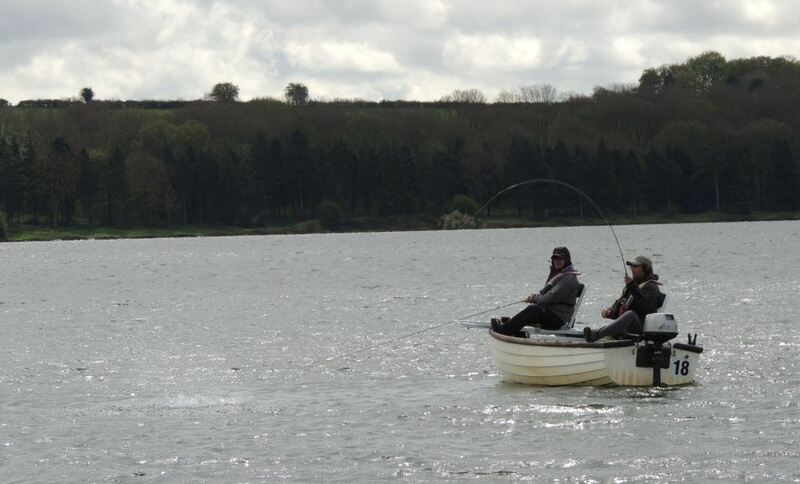 I met Mick few years ago, when we were boat partners during Grand Final of Lexus International competition held at Chew Valley lake. 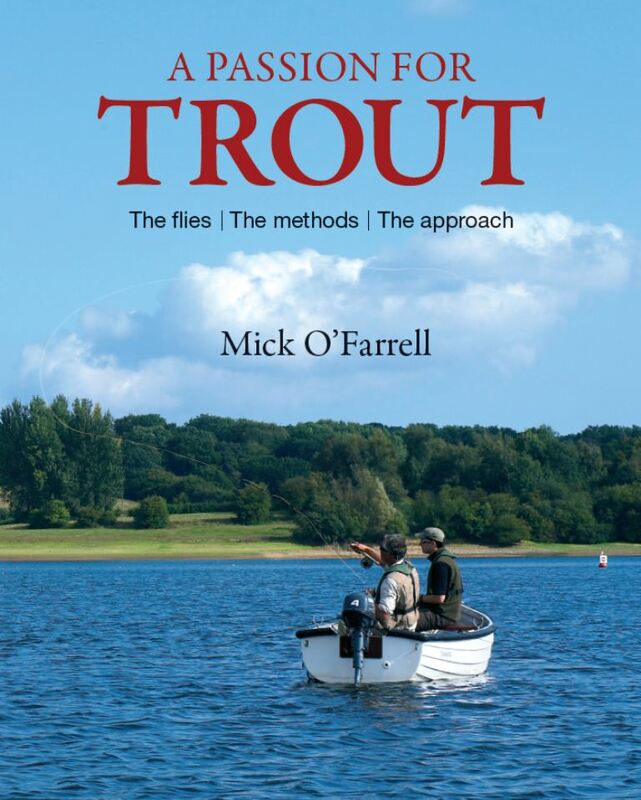 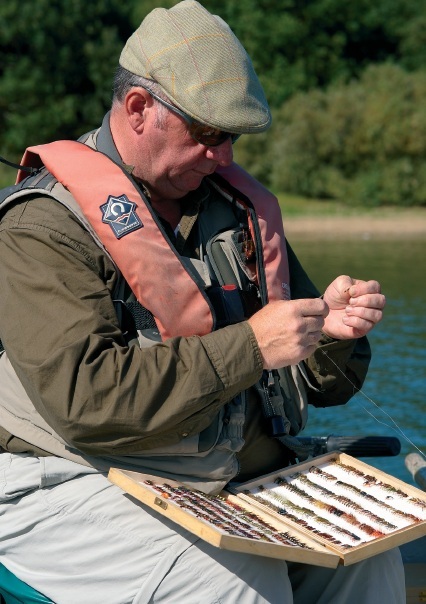 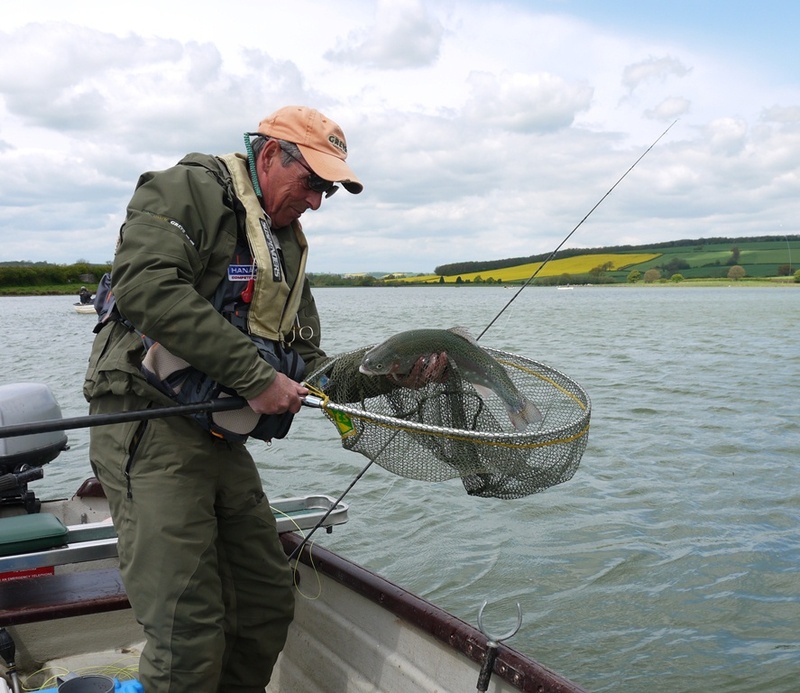 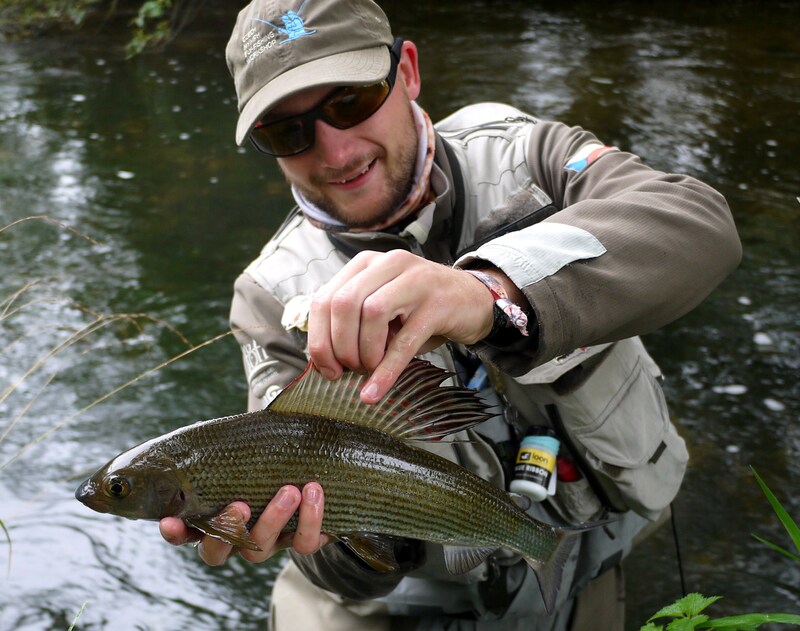 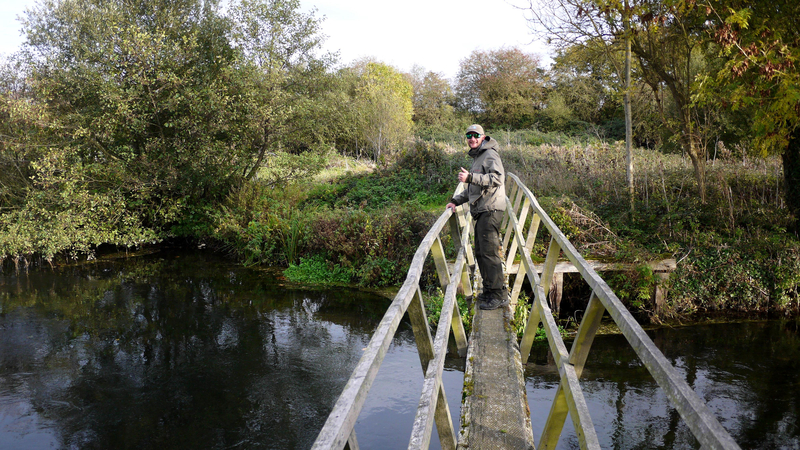 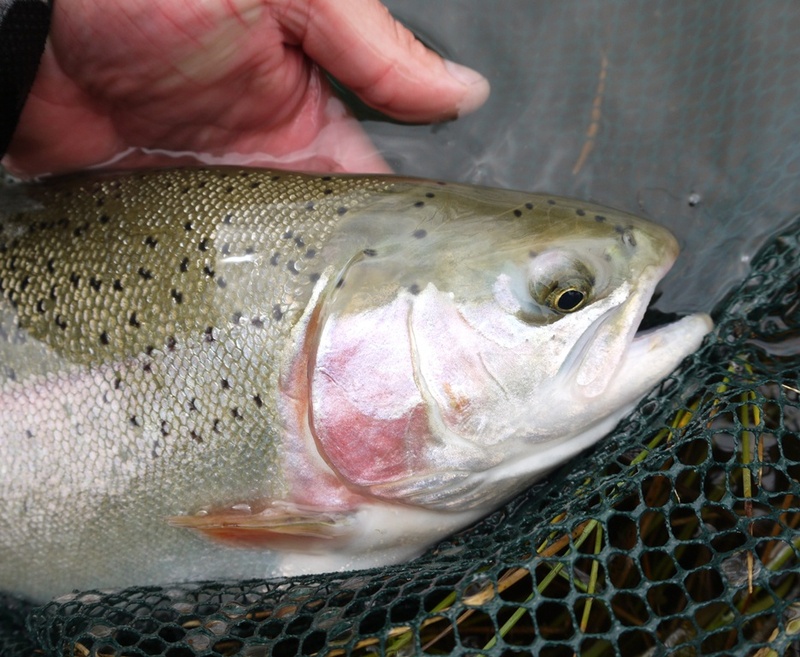 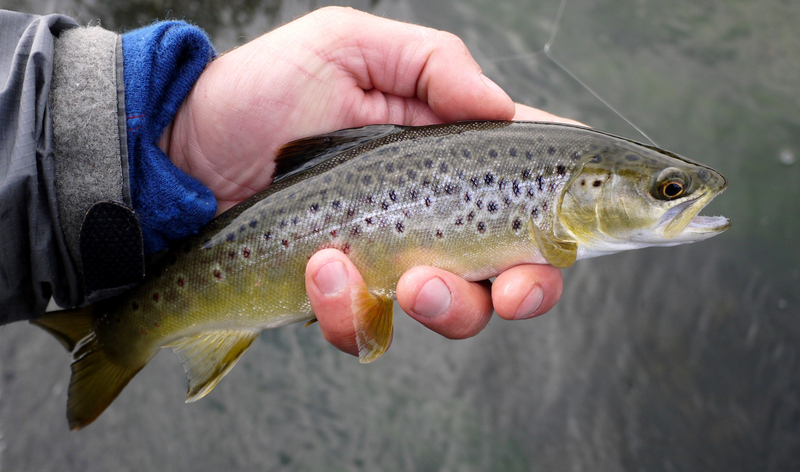 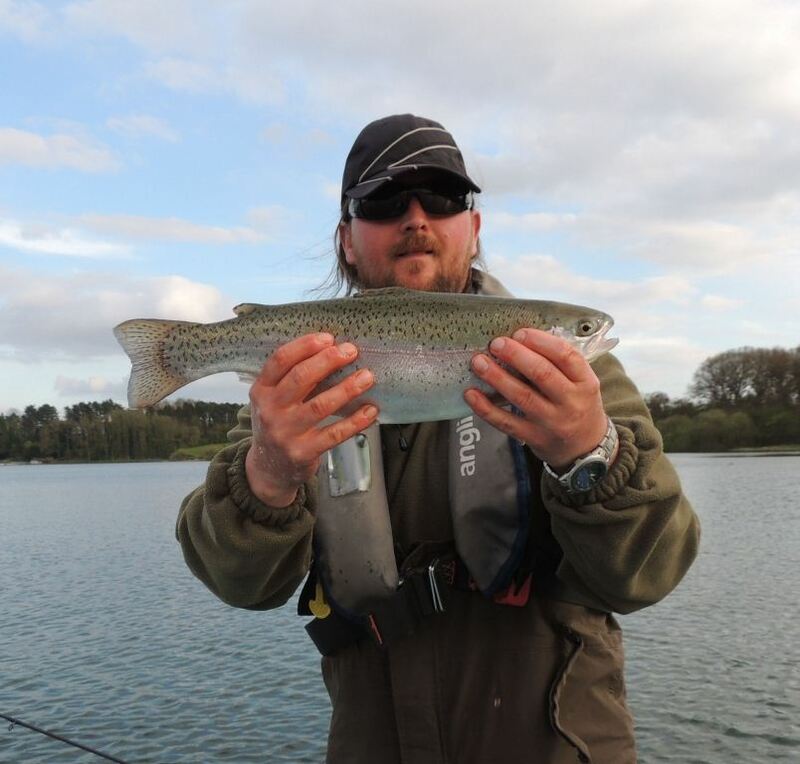 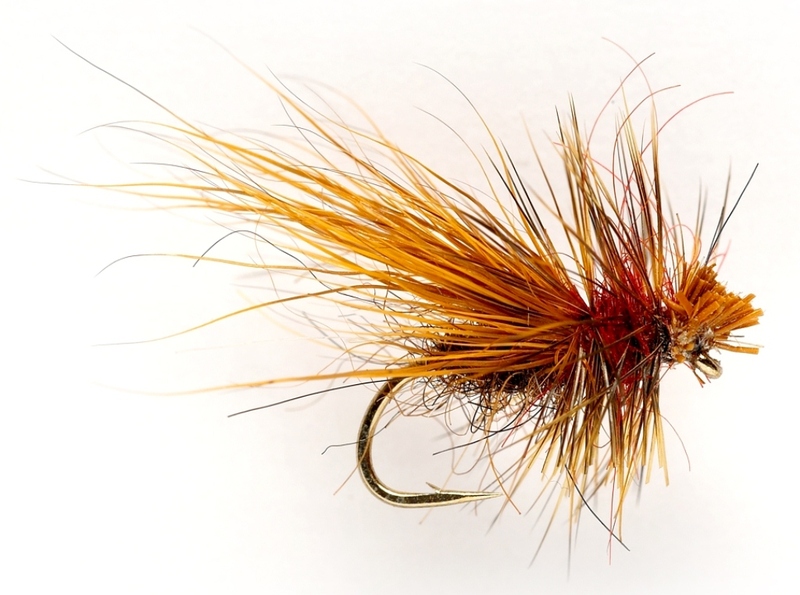 Mick is Irishman, but he has been living in England for a long time and he has applied experience from fishing for brown trout in Irish lakes to reservoirs in UK and he has created his own original stile of flies and fly-fishing methods. 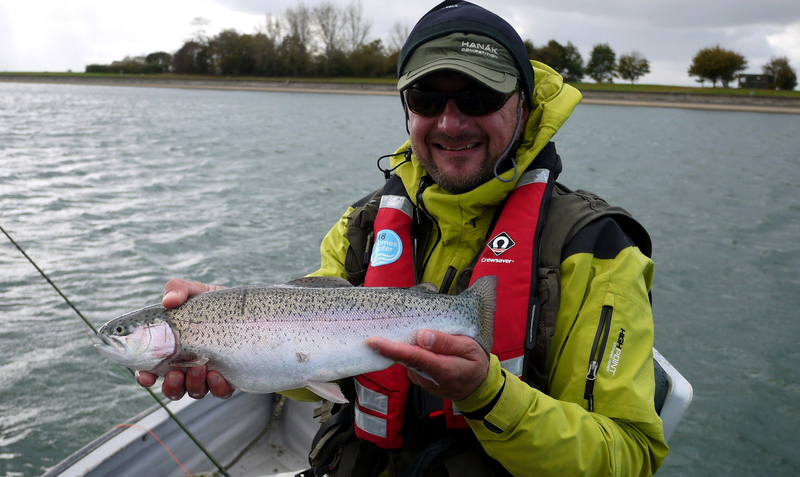 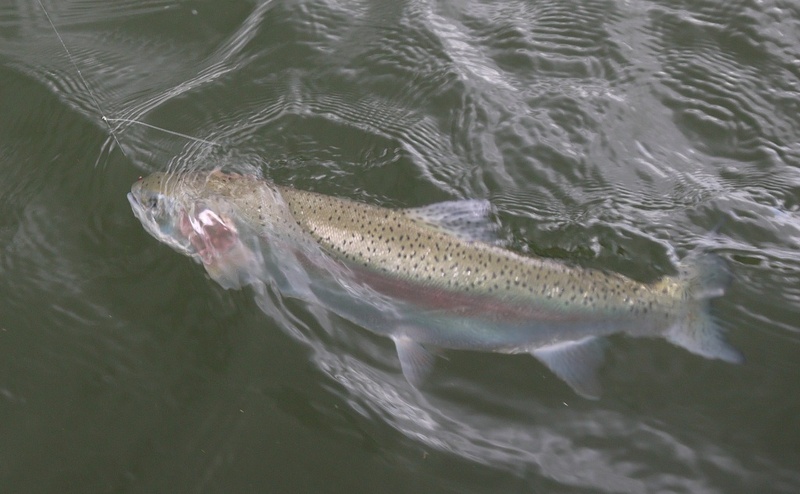 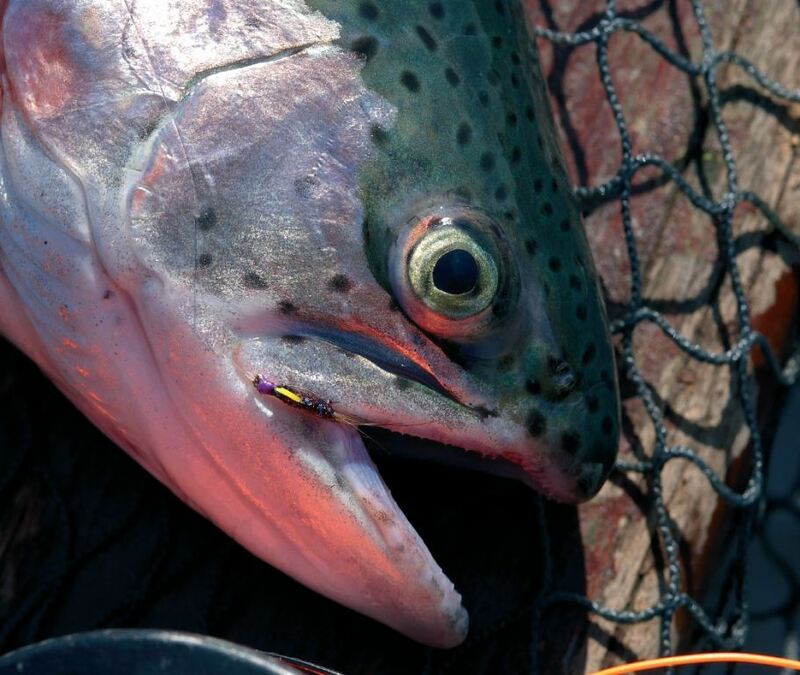 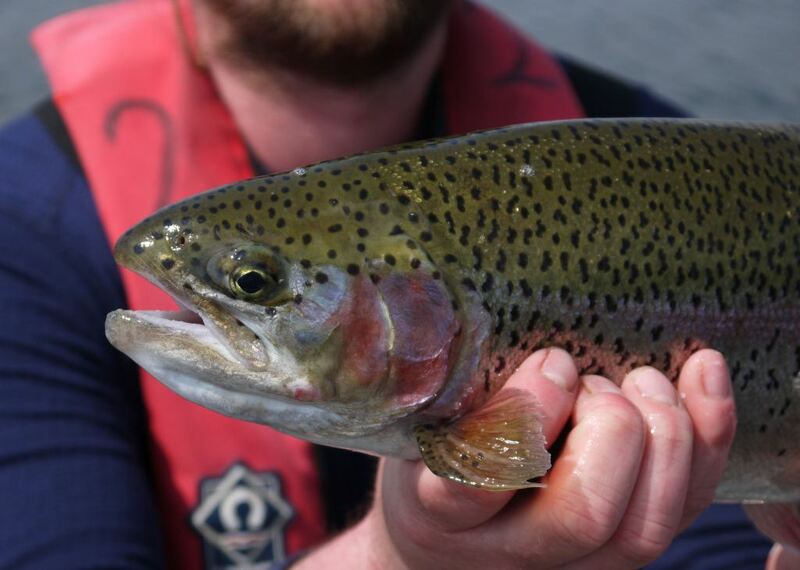 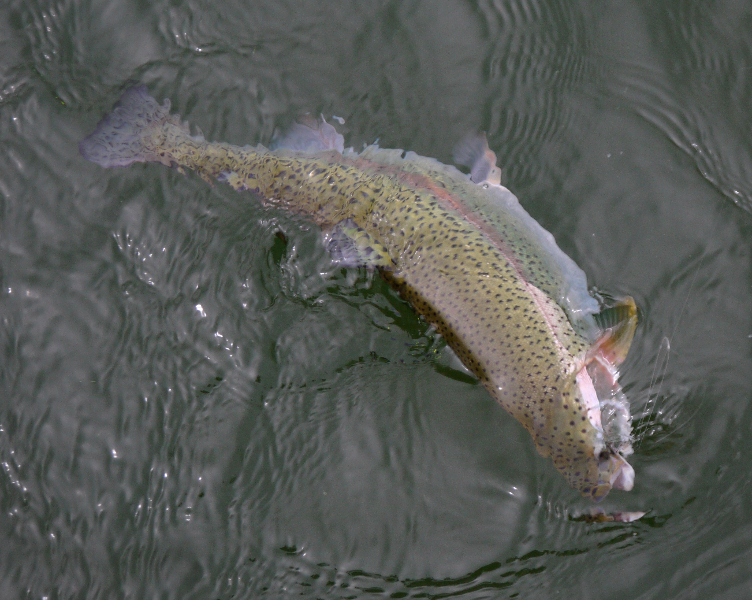 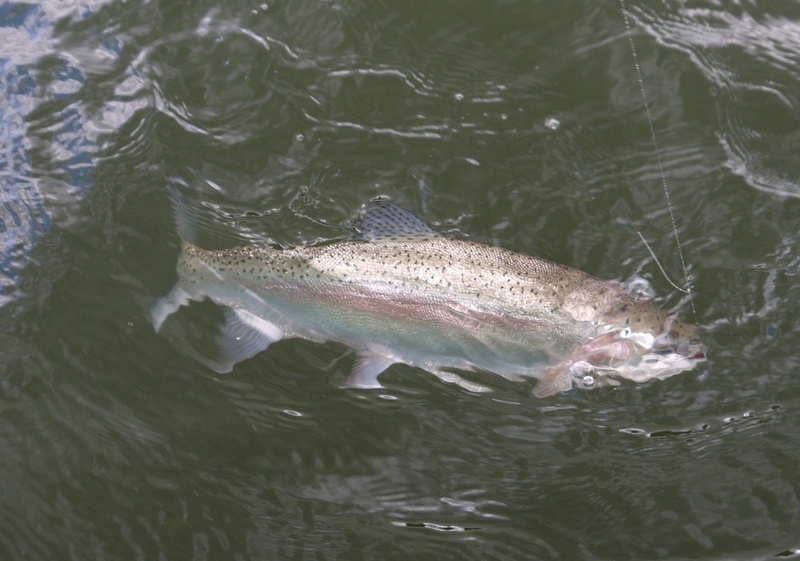 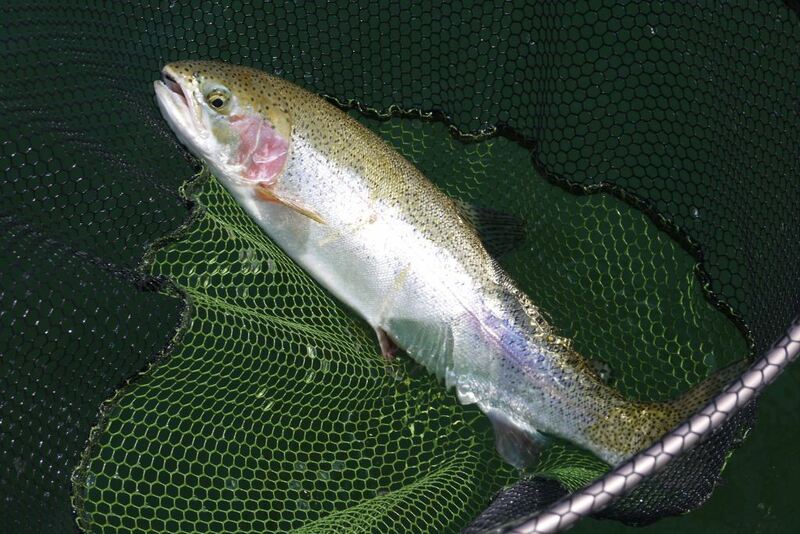 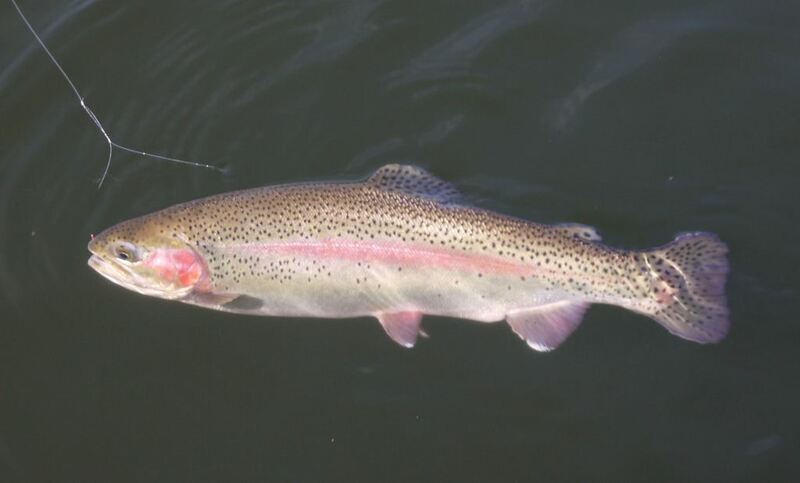 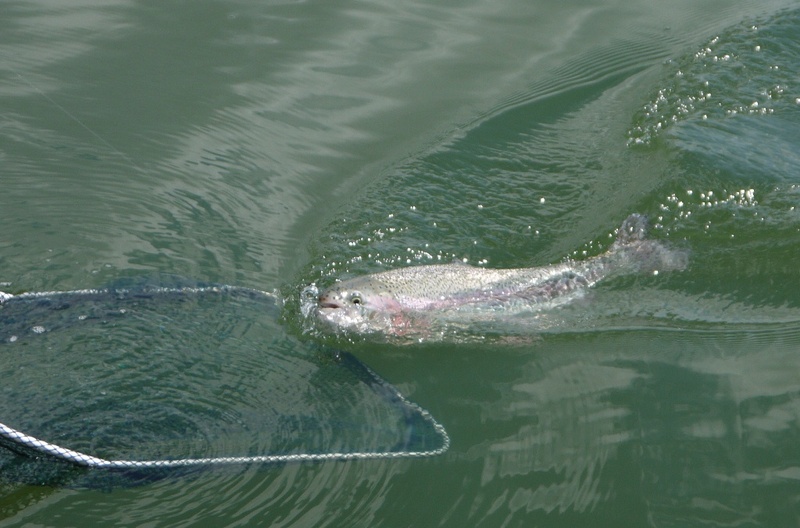 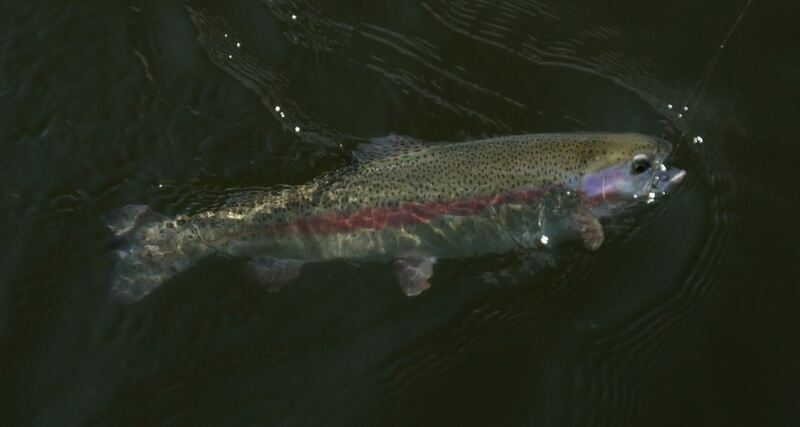 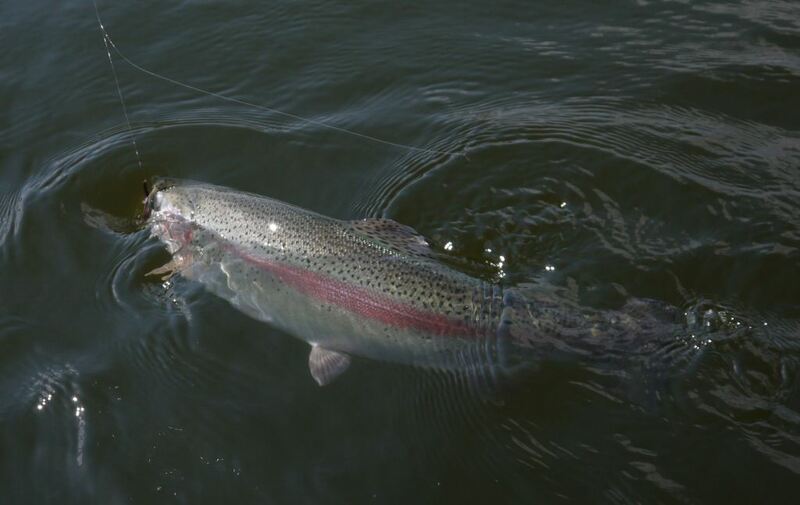 When all anglers fish for rainbows with blobs, he has the same success with dabblers and diawlbachs. 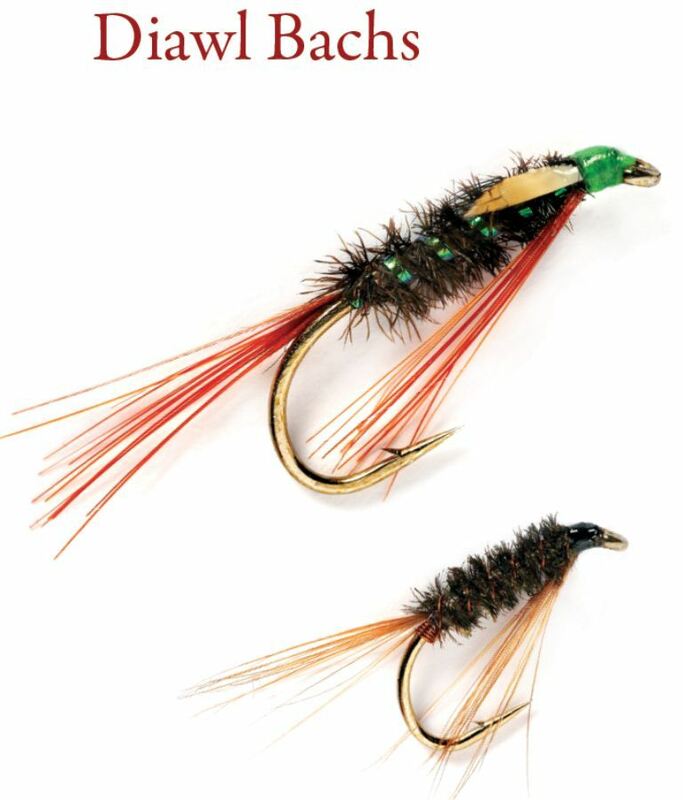 Book is richly illustrated and mainly more than 400 pictures of flies tied by himself are fantastic. 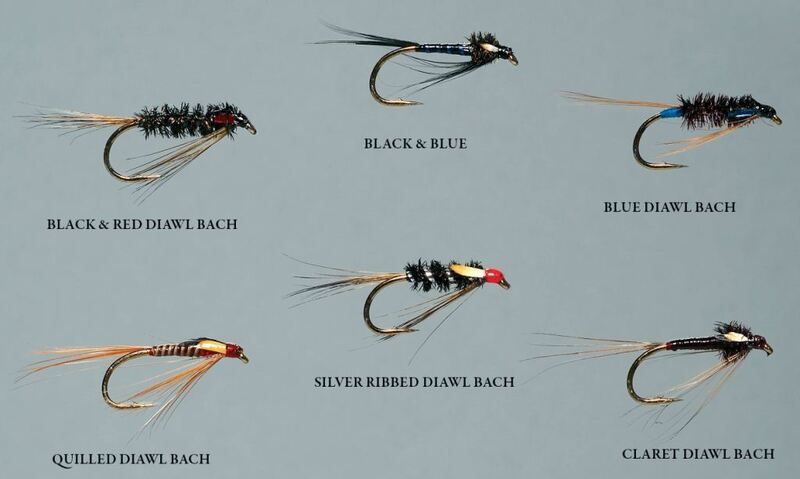 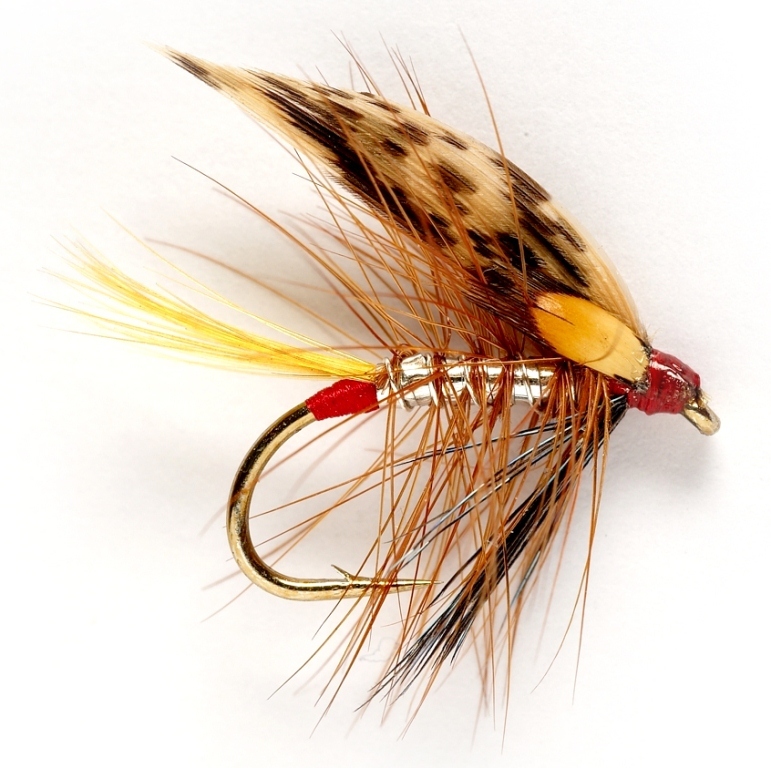 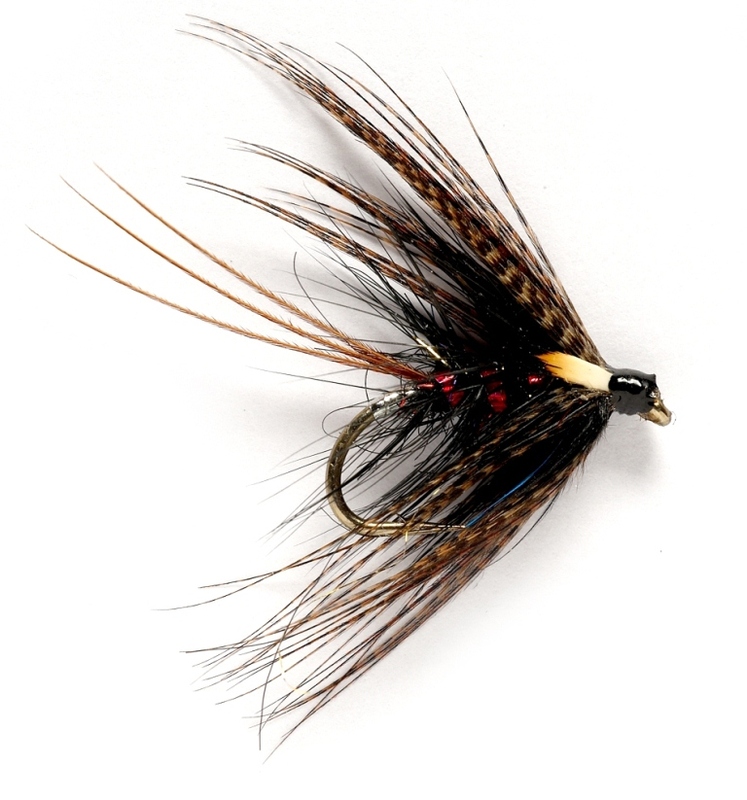 Each fly is illustrated with colour photography and each has a precise and detailed recipe to make sure that the reader can tie the fly exactly as he intended and in doing so enjoy the same success.